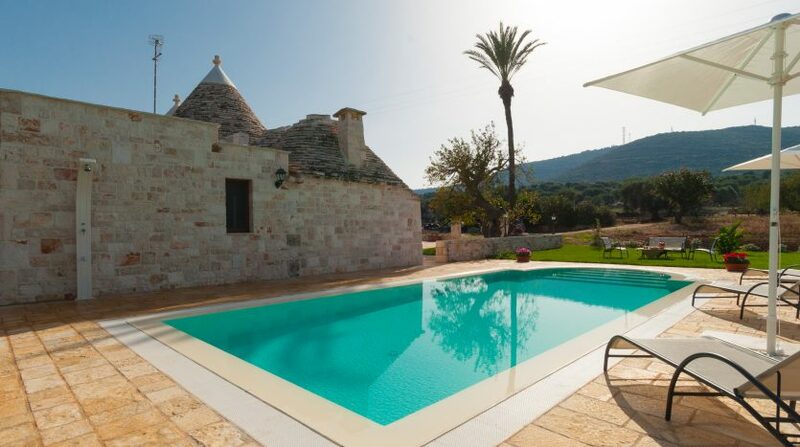 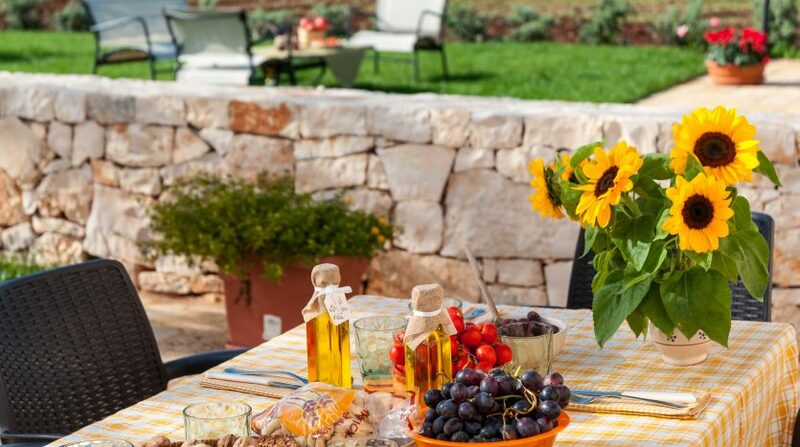 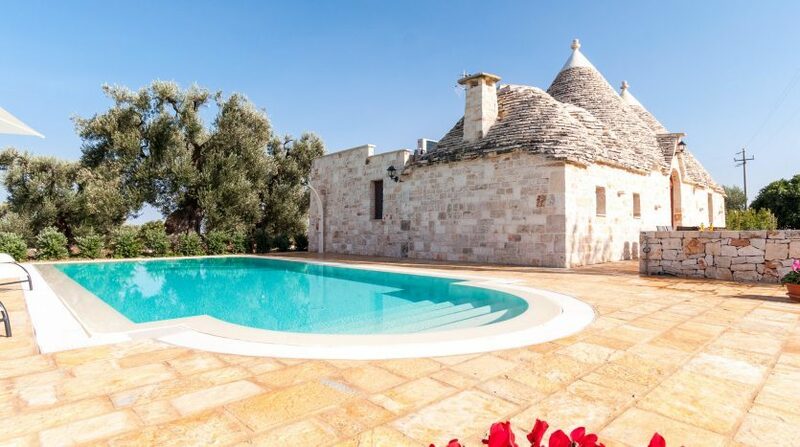 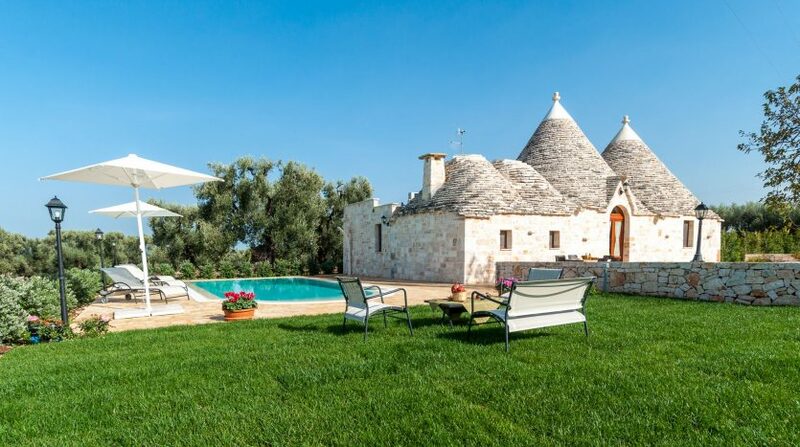 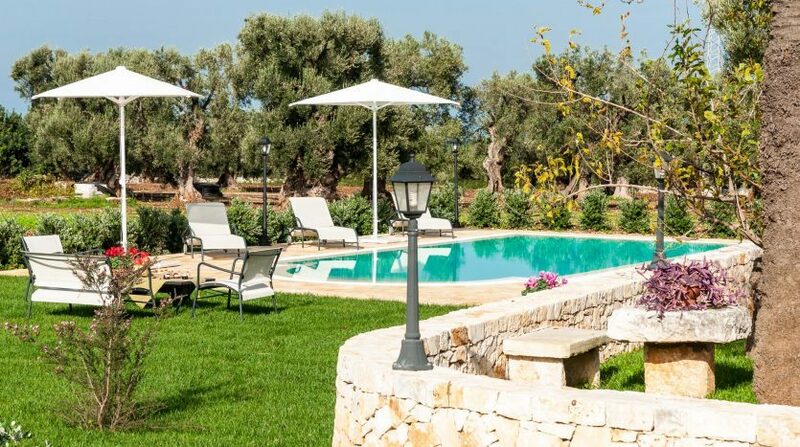 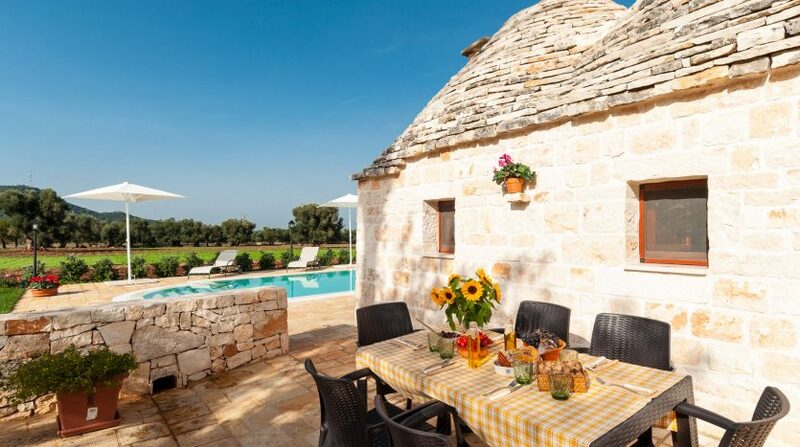 Enjoy your holiday in a trulli with pool, tuck into culinary delights, explore Apulia’s picturesque villages and its coast, still untouched by mass tourism! 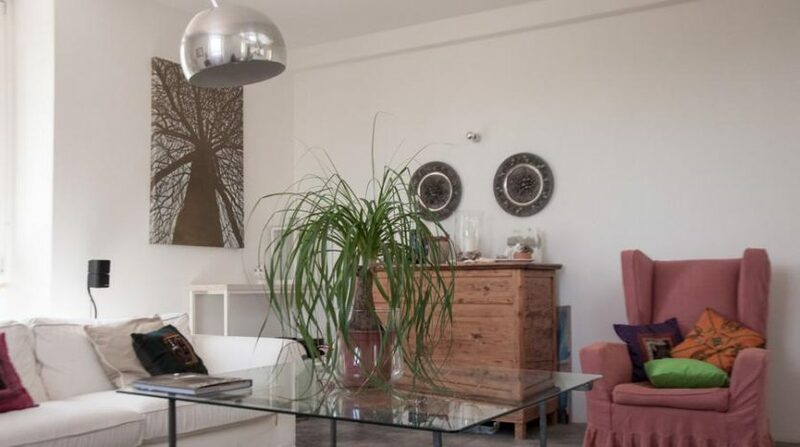 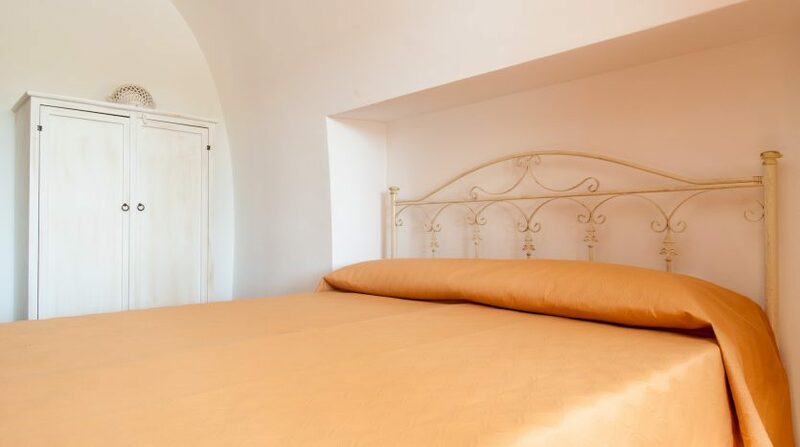 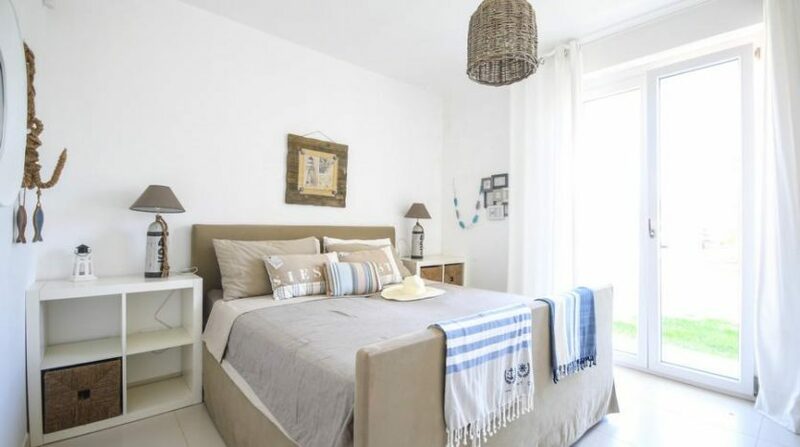 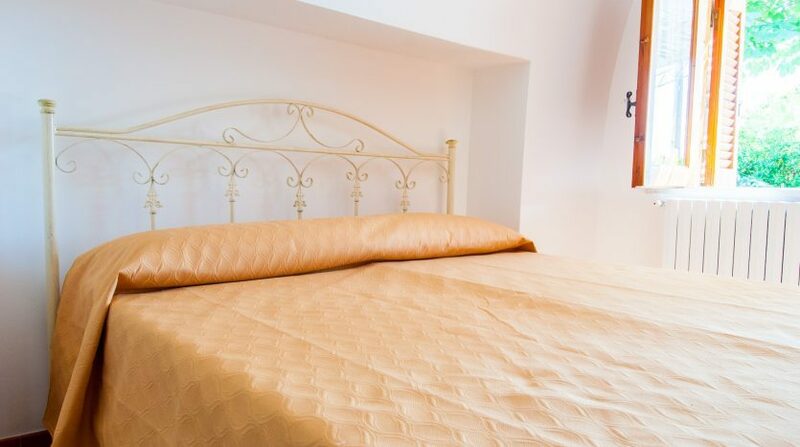 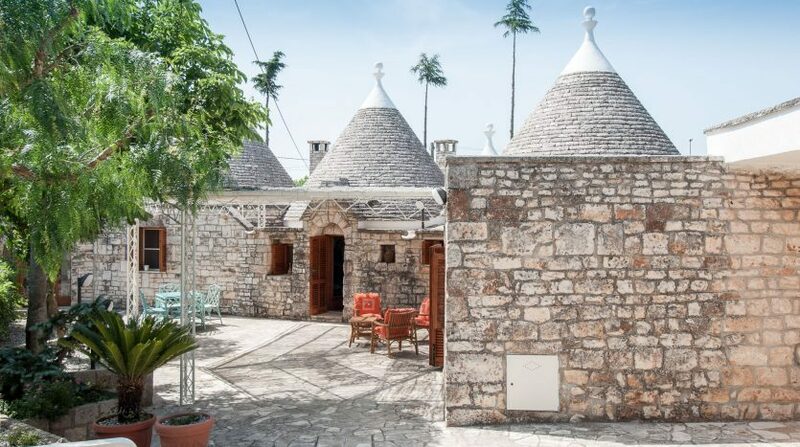 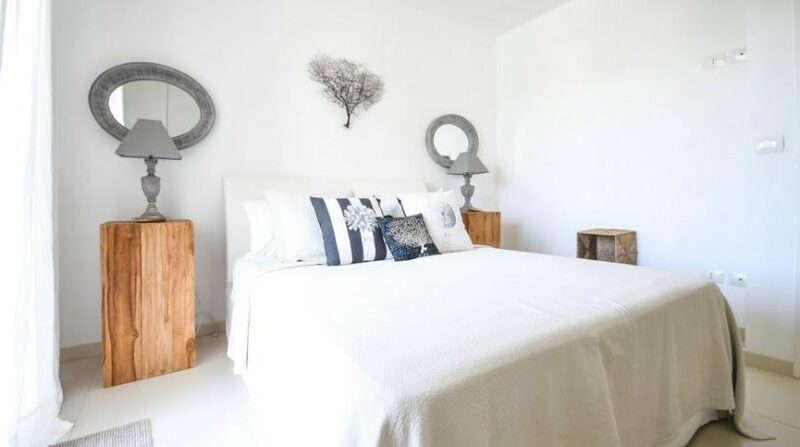 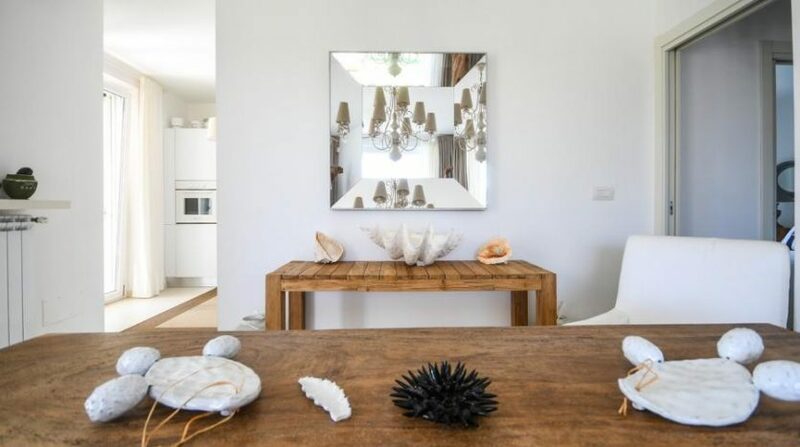 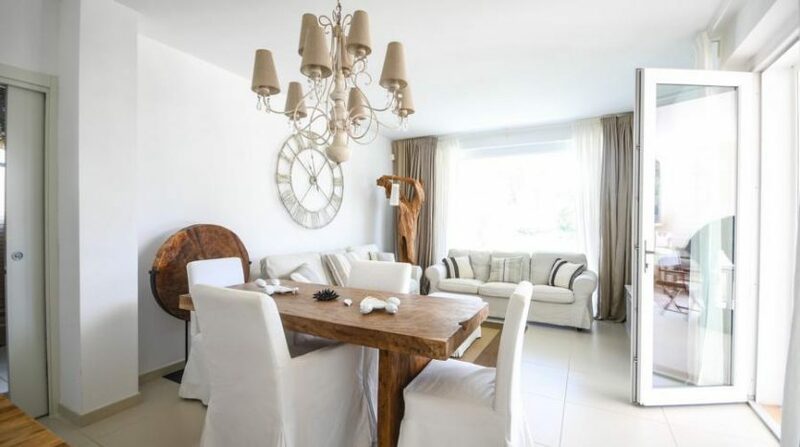 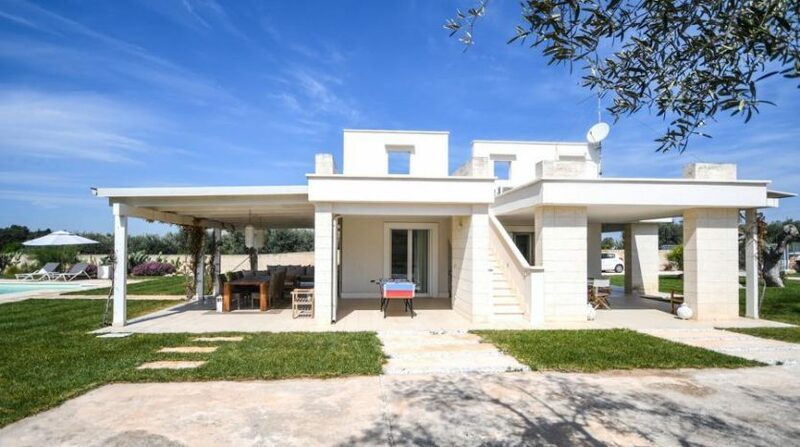 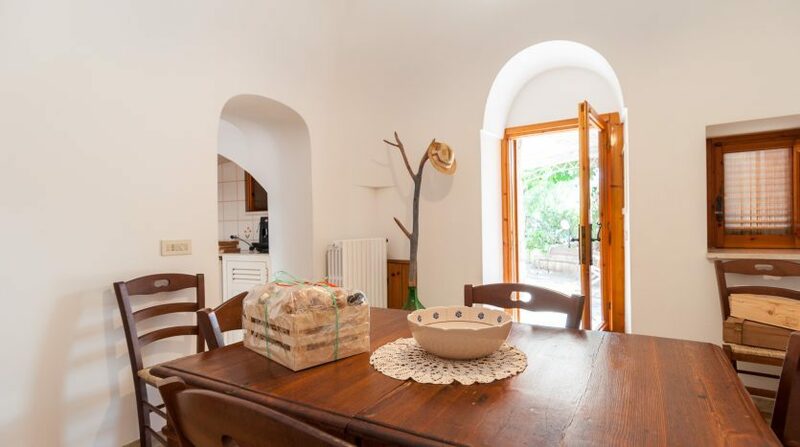 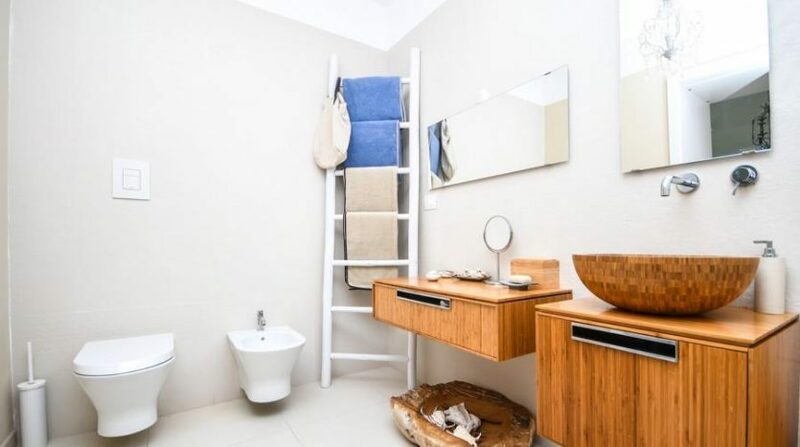 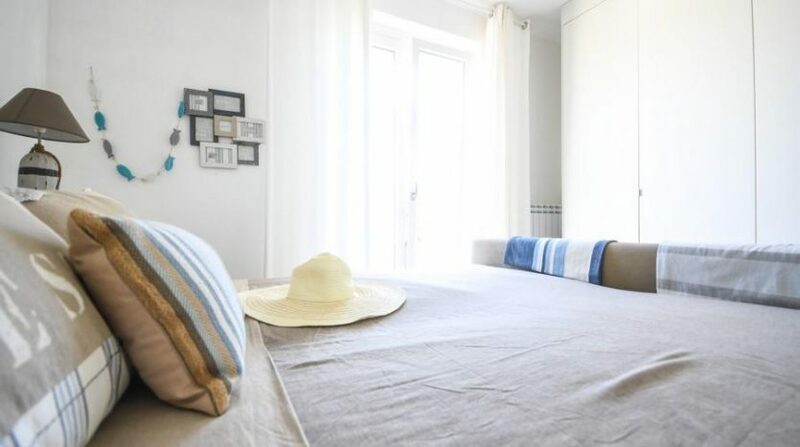 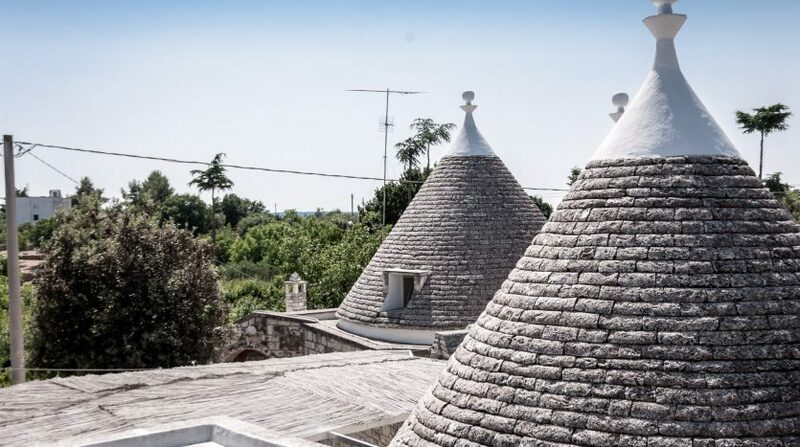 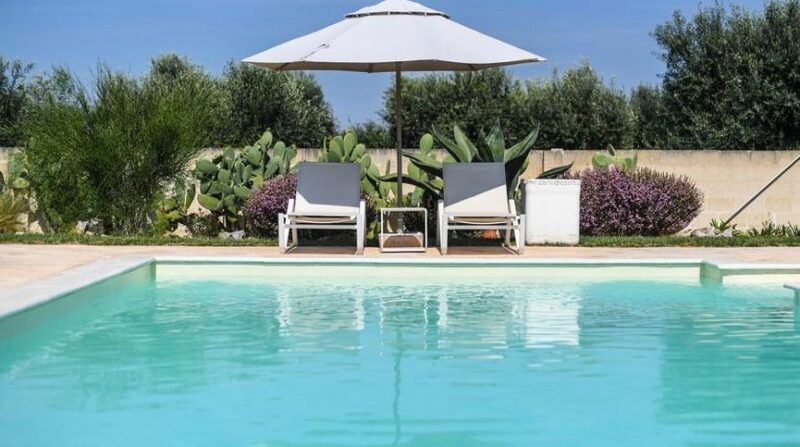 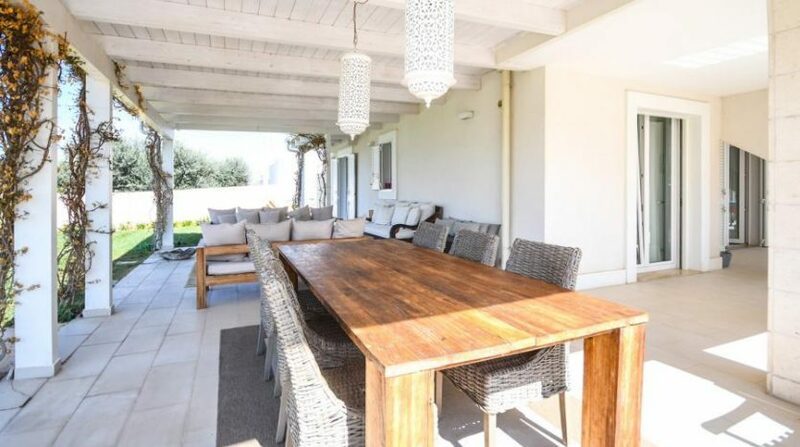 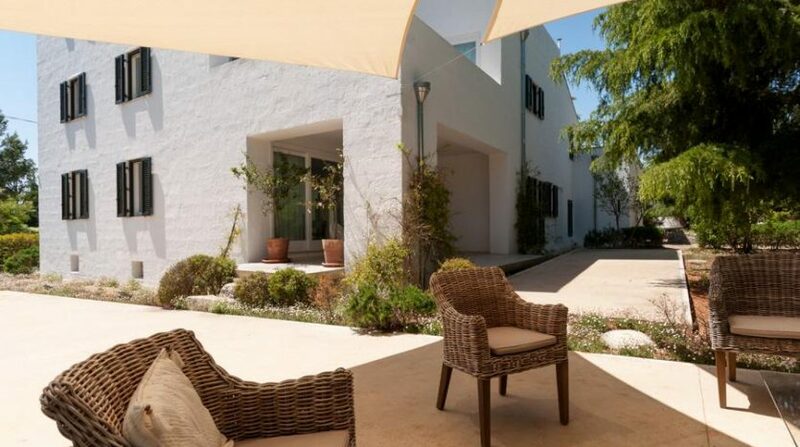 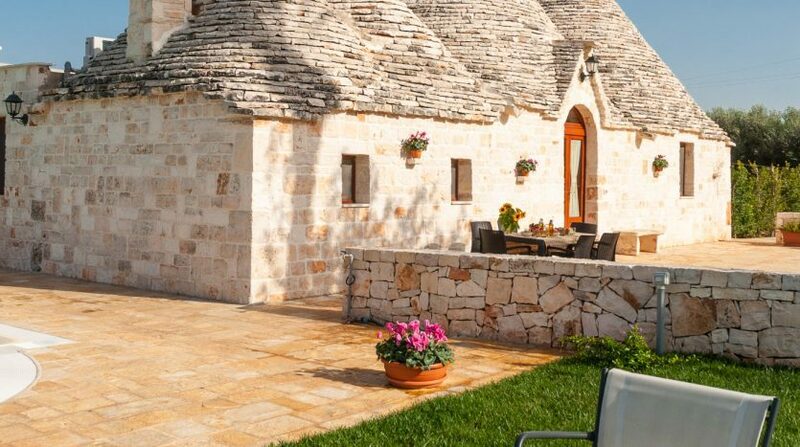 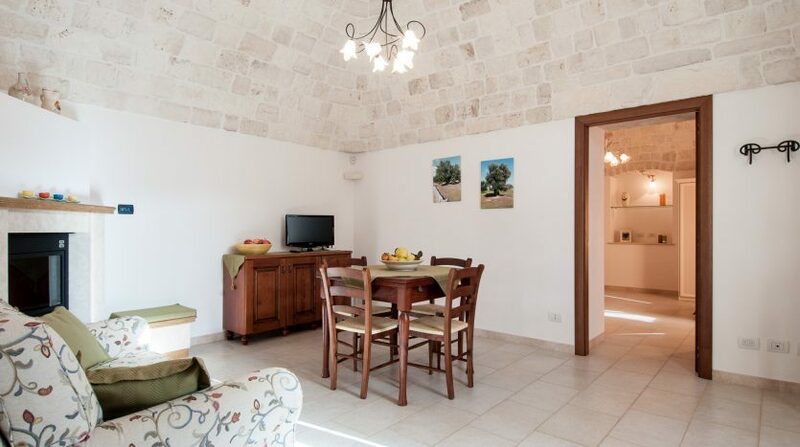 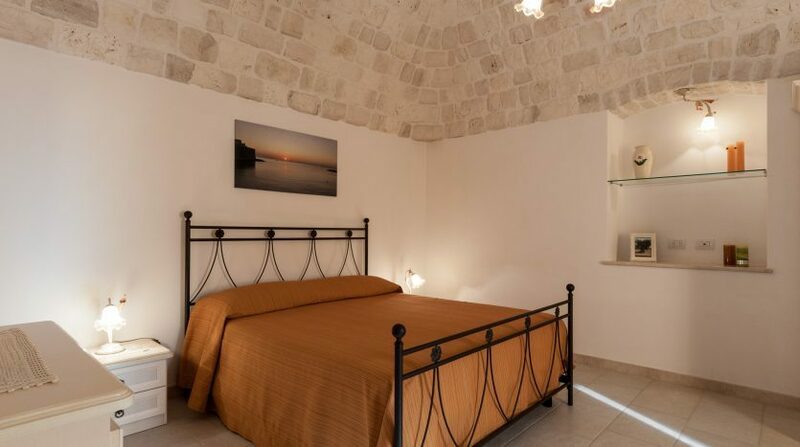 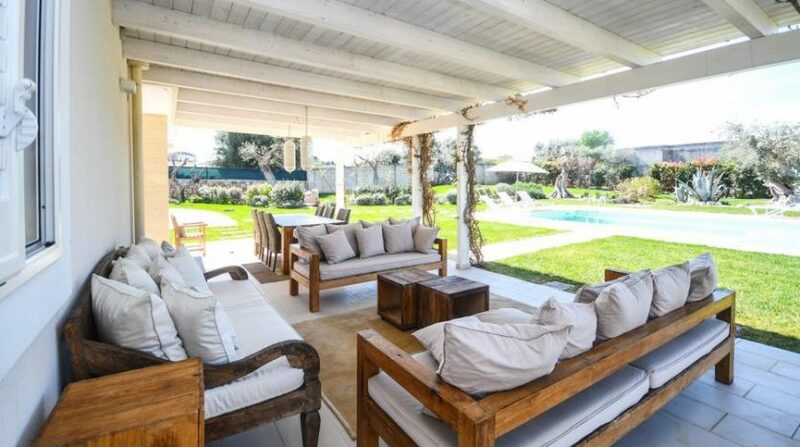 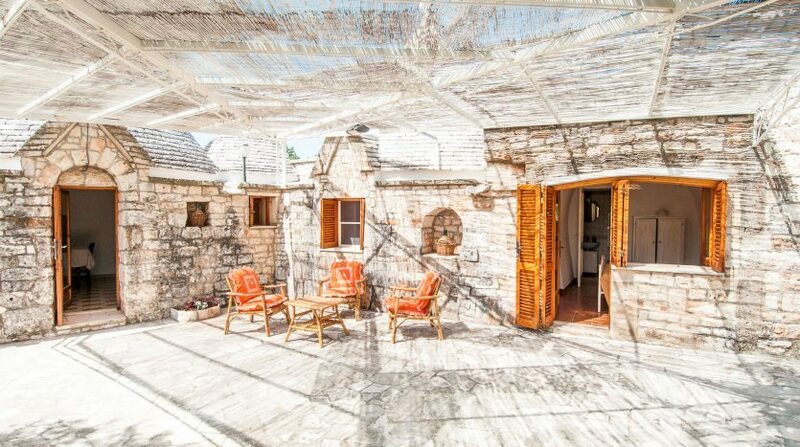 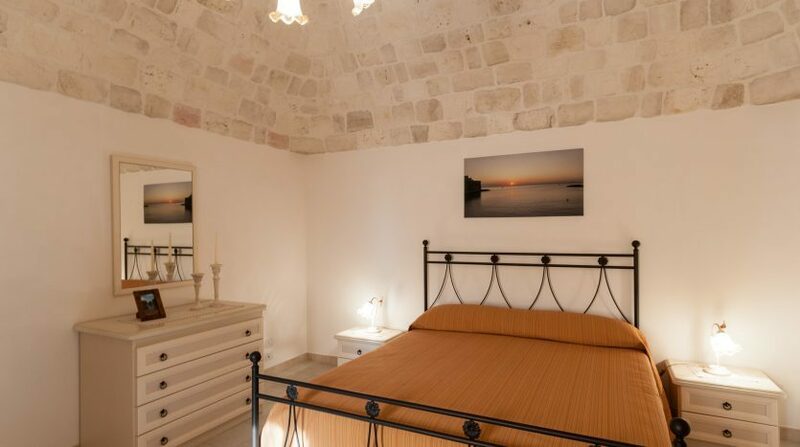 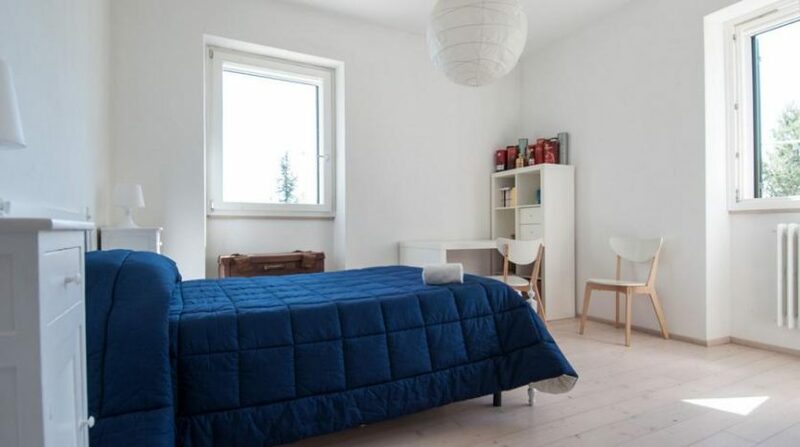 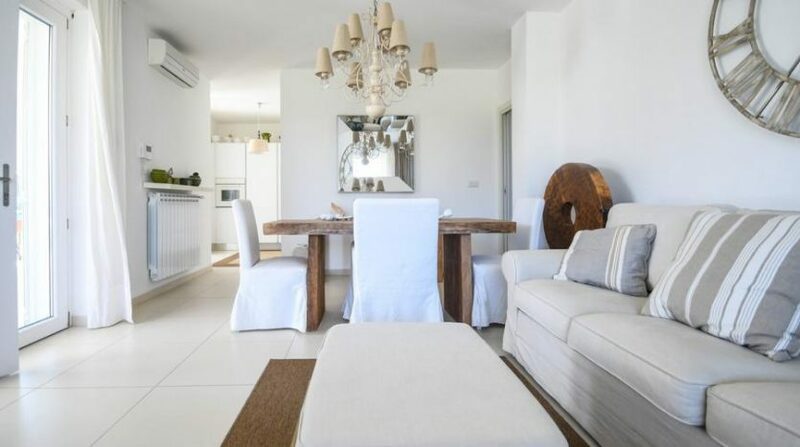 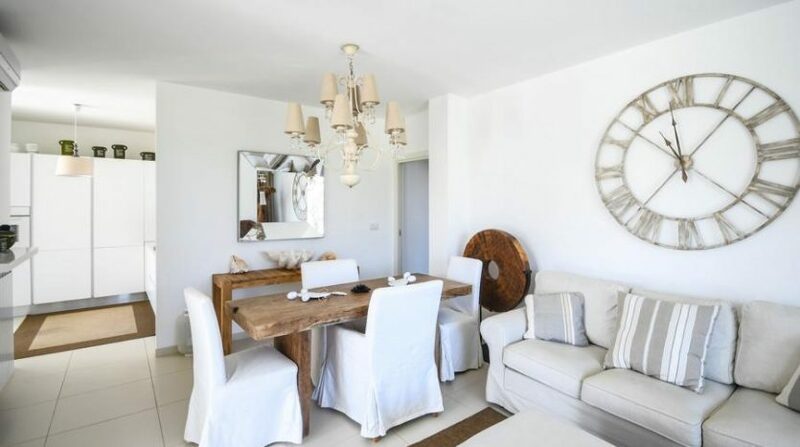 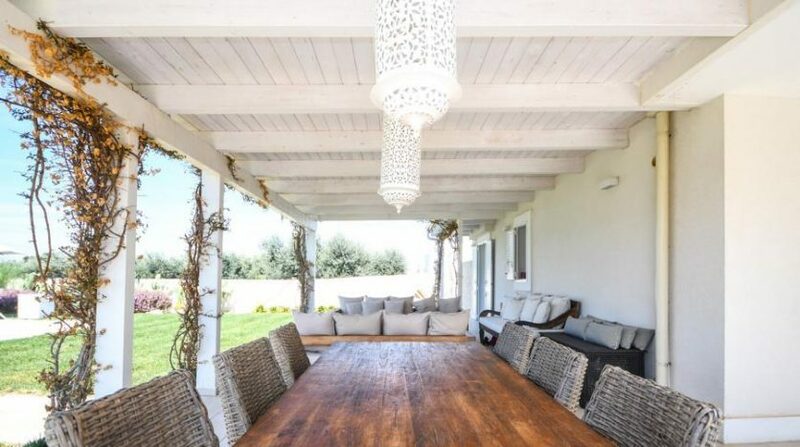 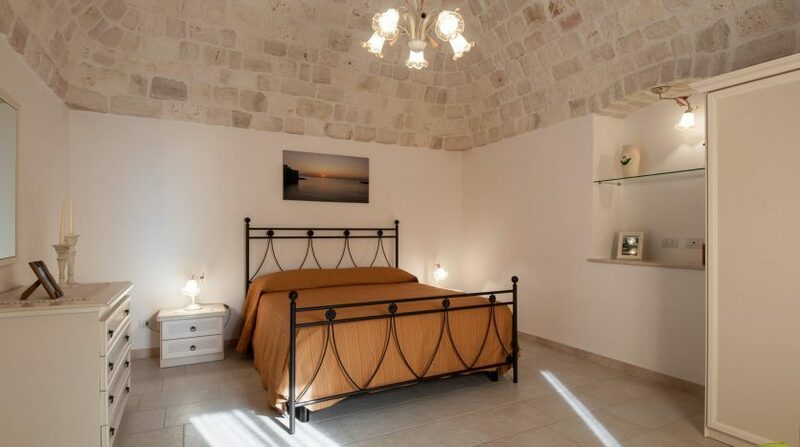 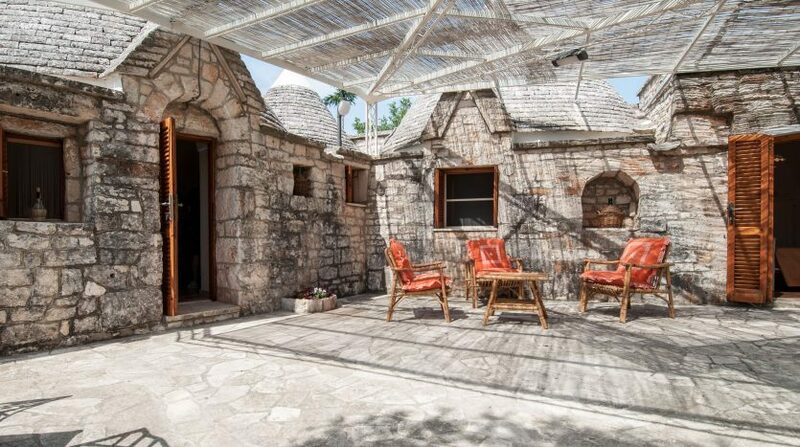 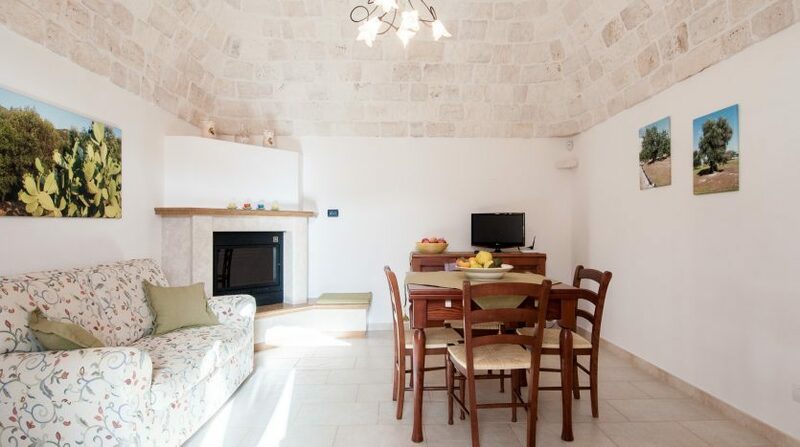 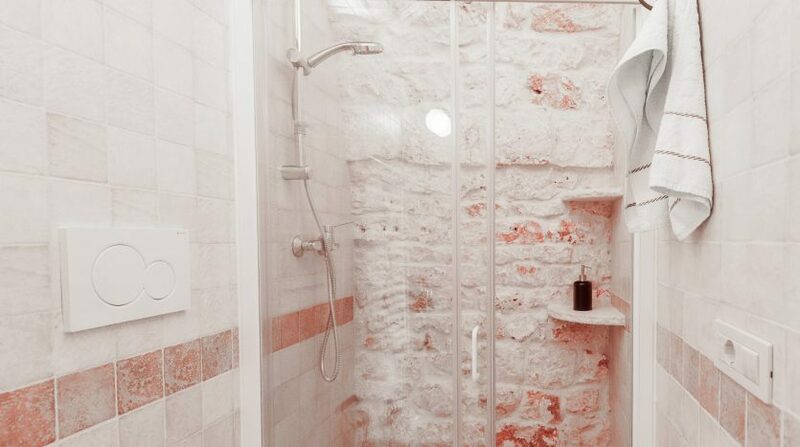 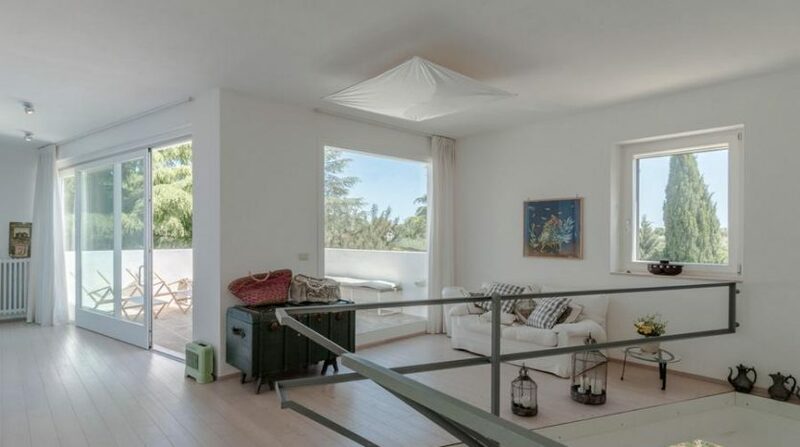 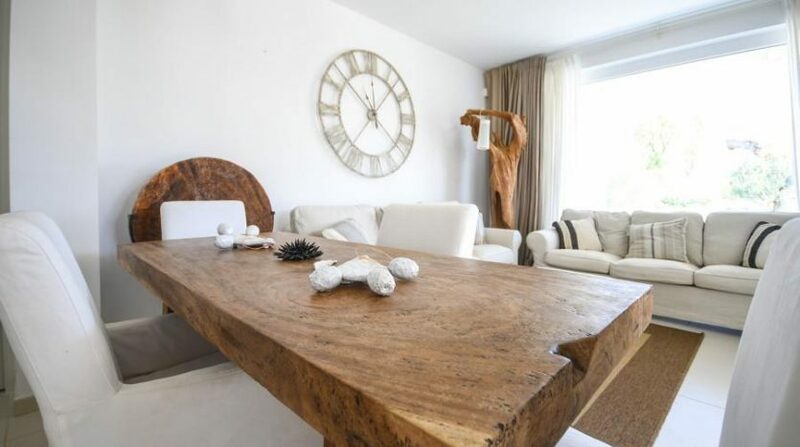 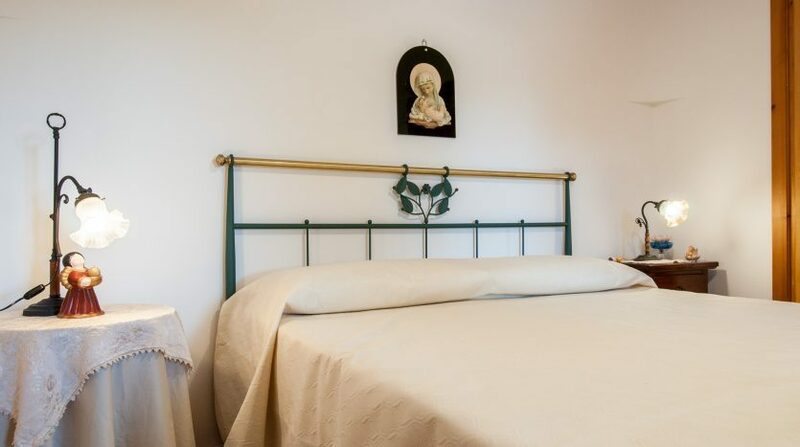 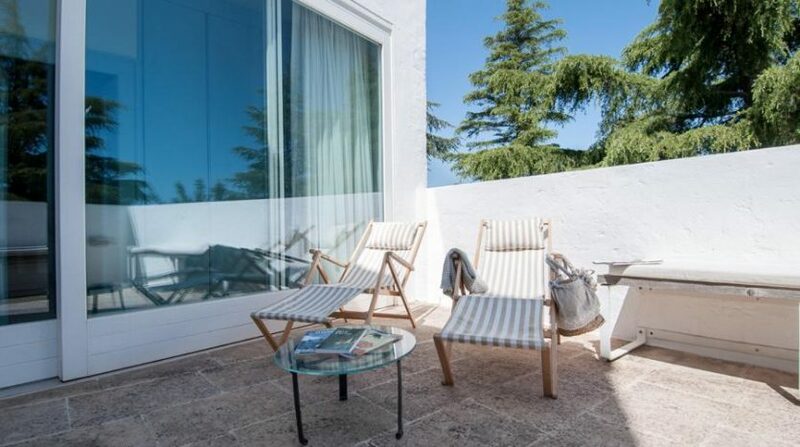 Close to the sea and surrounded by the hills of Monopoli, Alberobello and Castellana Grotte in the Salento region, you will find this lovely trulli complex, the Trulli Margherita. 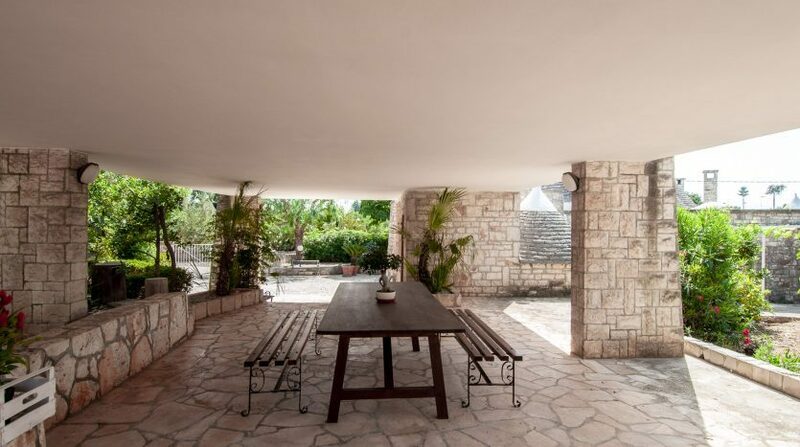 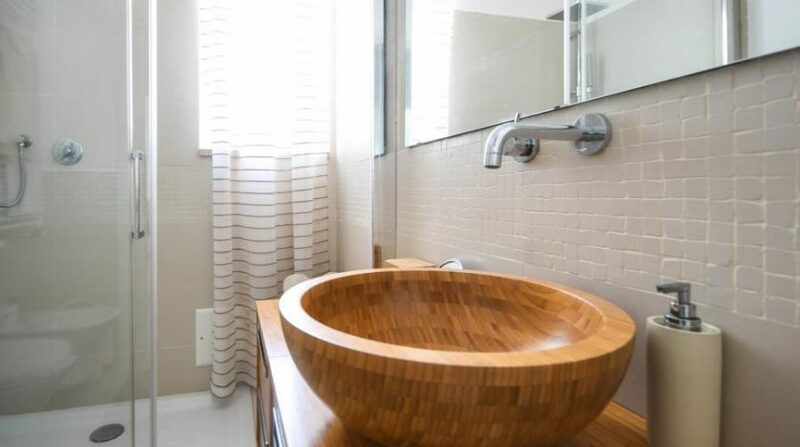 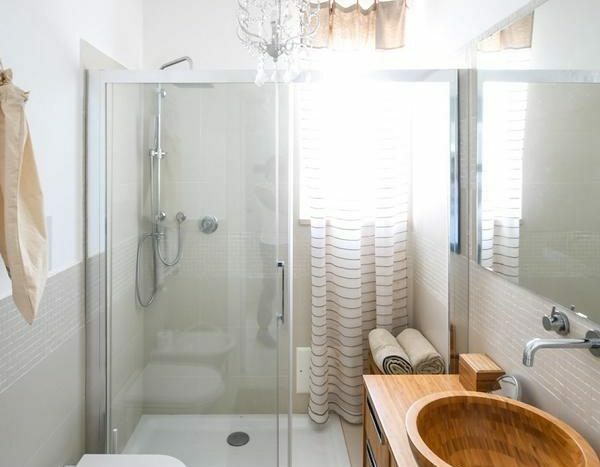 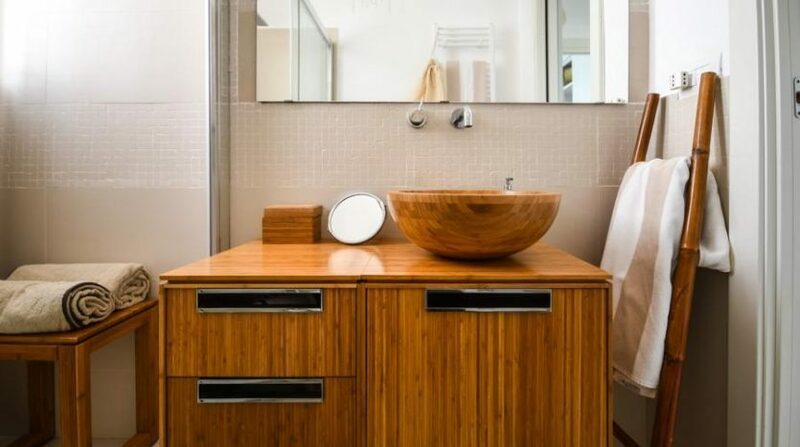 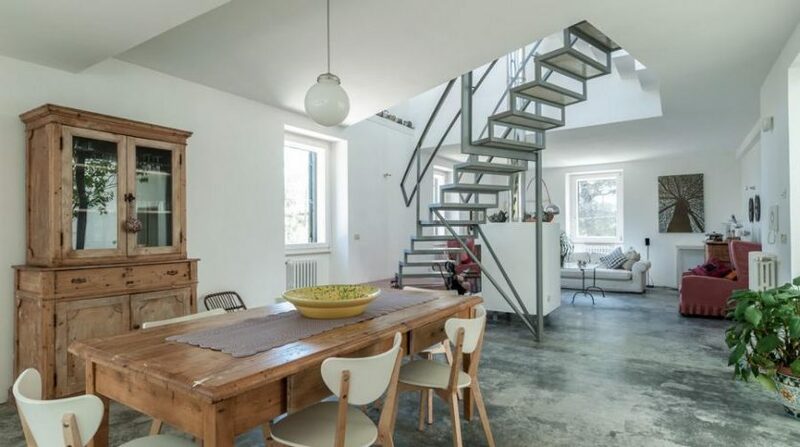 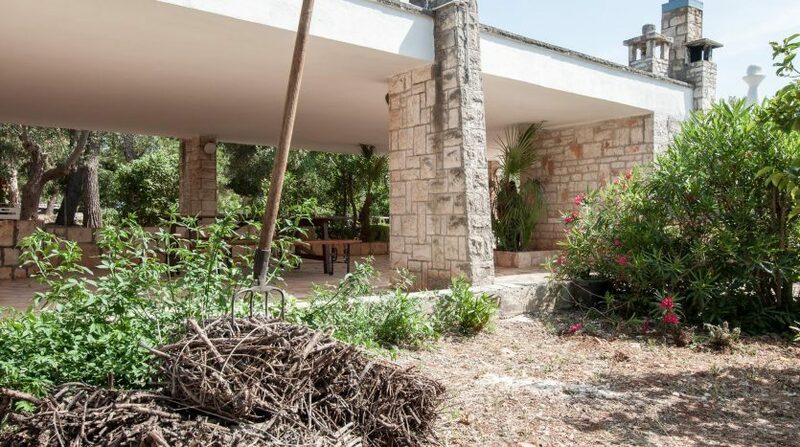 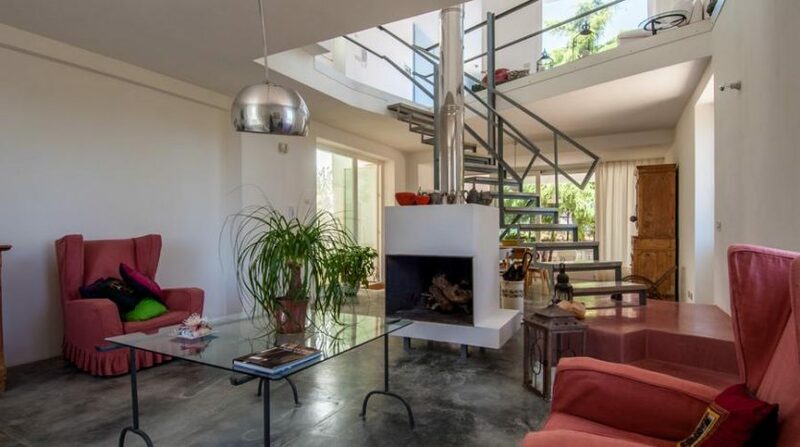 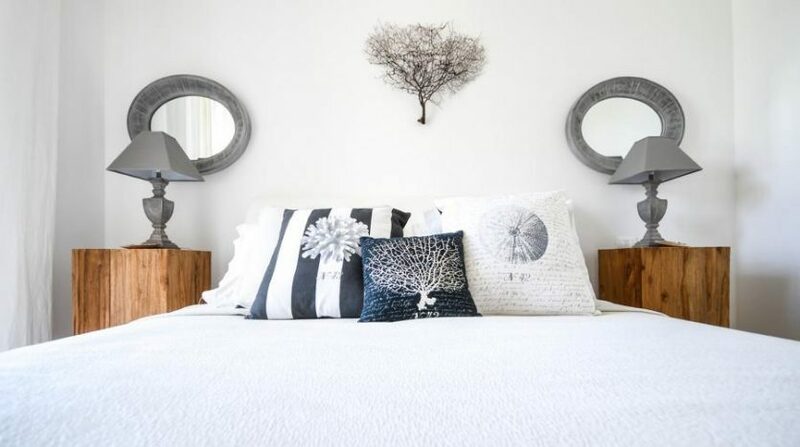 This compound accommodates up to eight people and has three bedrooms, two bathrooms and a private pool. 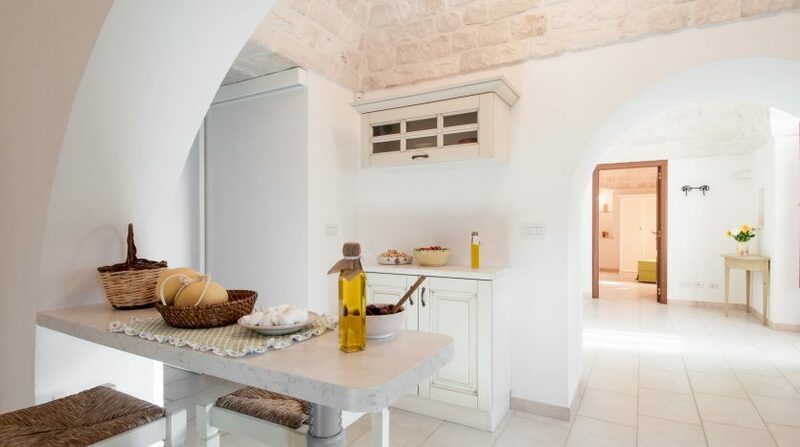 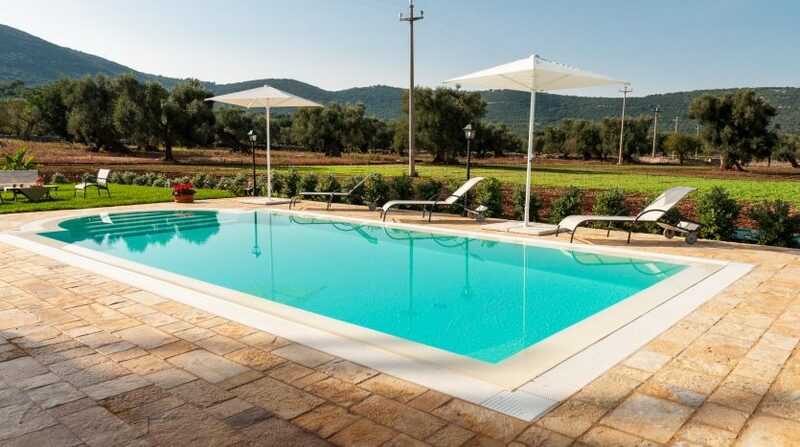 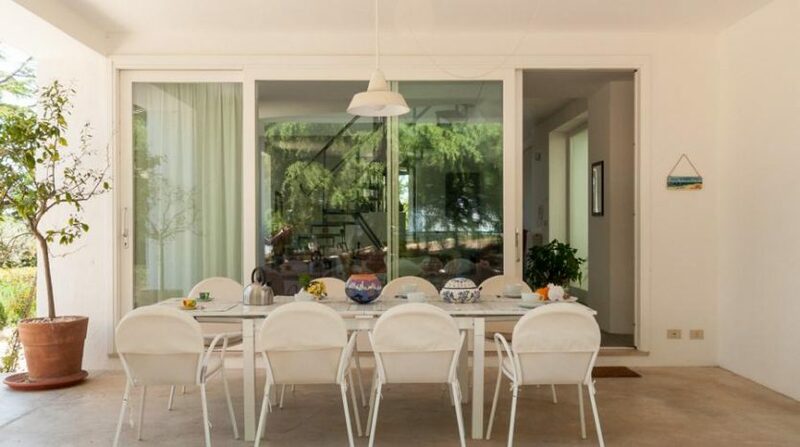 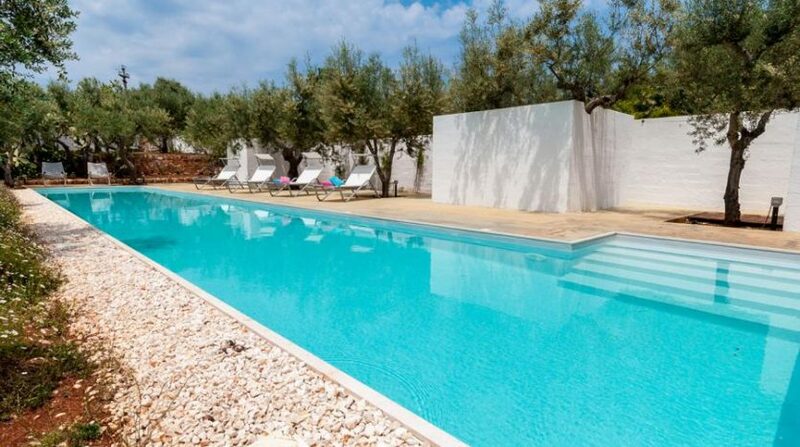 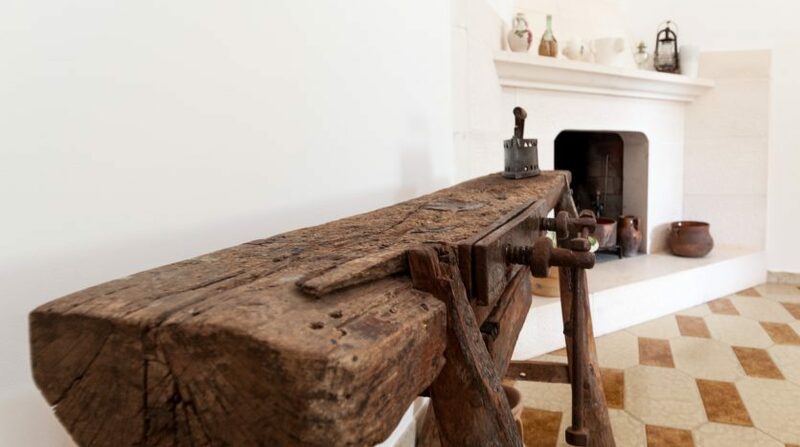 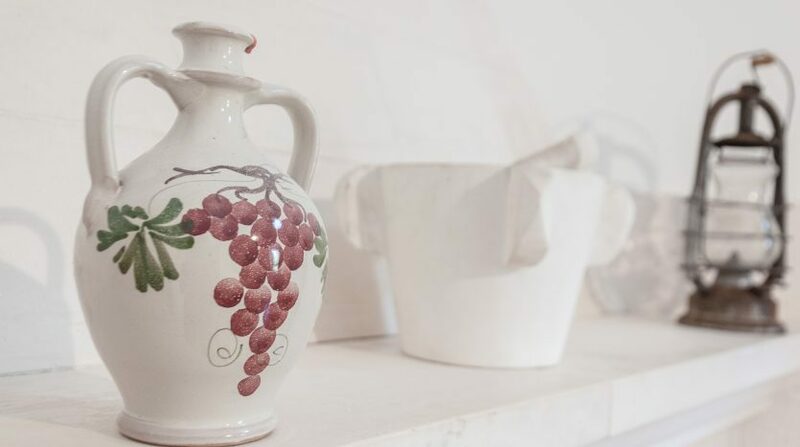 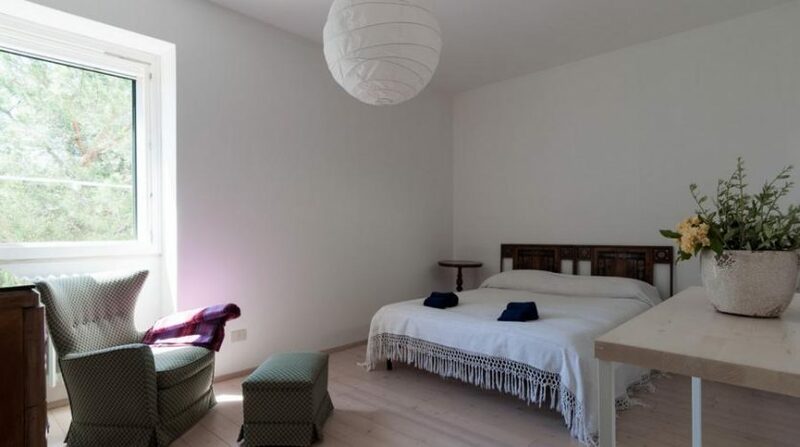 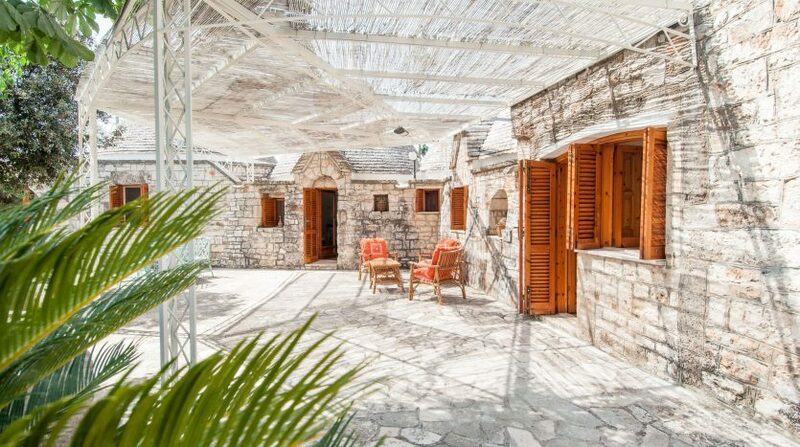 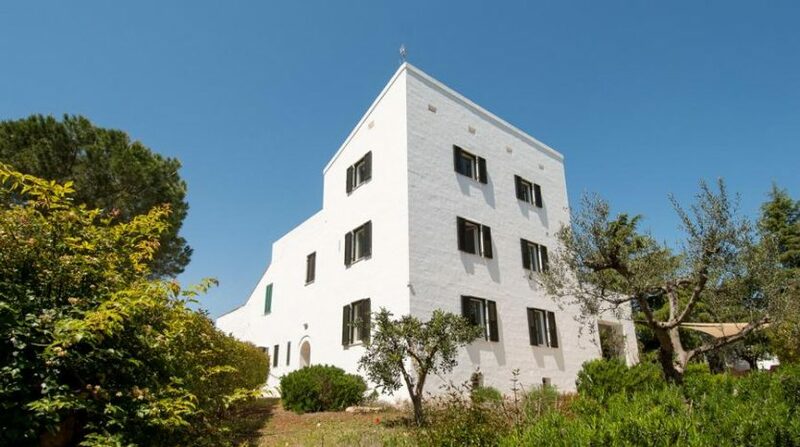 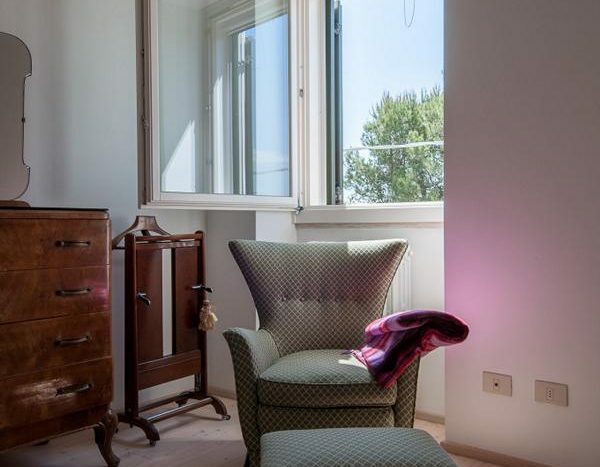 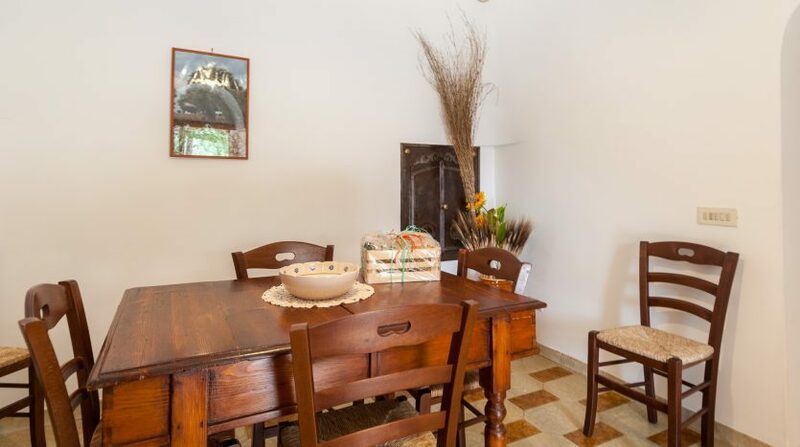 These buildings have been expertly and sympathetically restored to give holidaymakers an intimate experience of the history and traditions of the Apulian region. 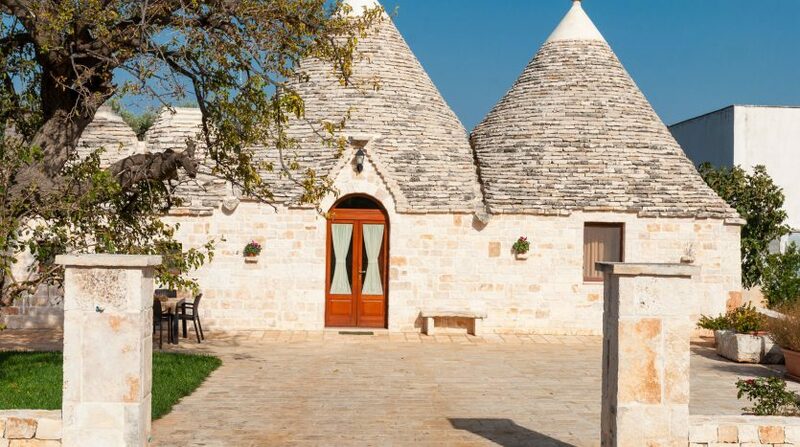 In other words, spend your Apulian holiday in a trulli to get the most authentic holiday experience possible in this part of southern Italy. 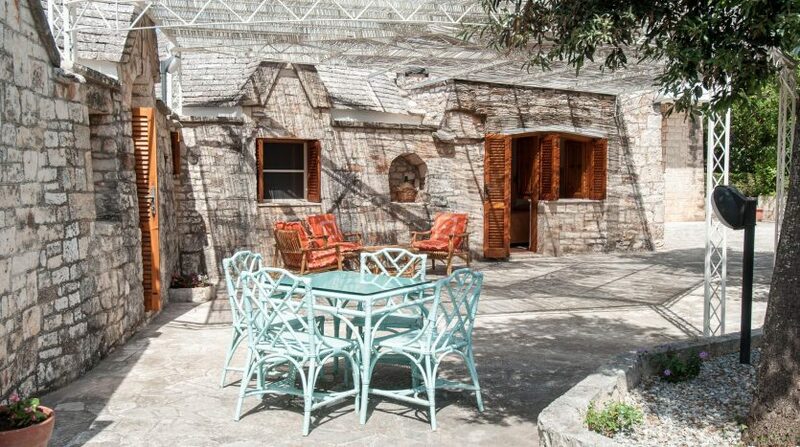 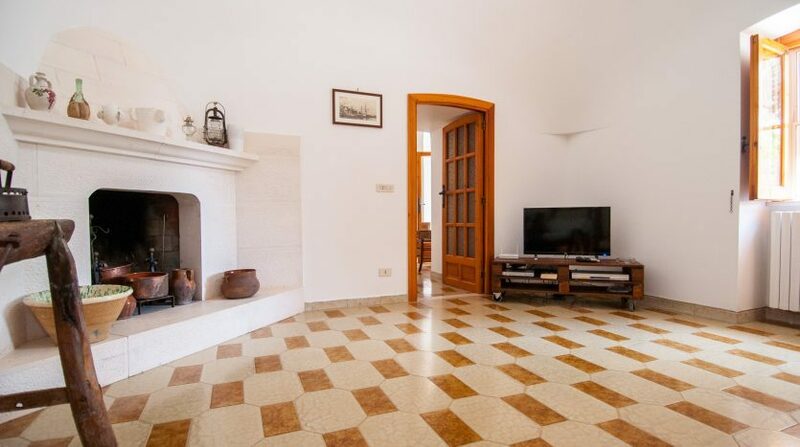 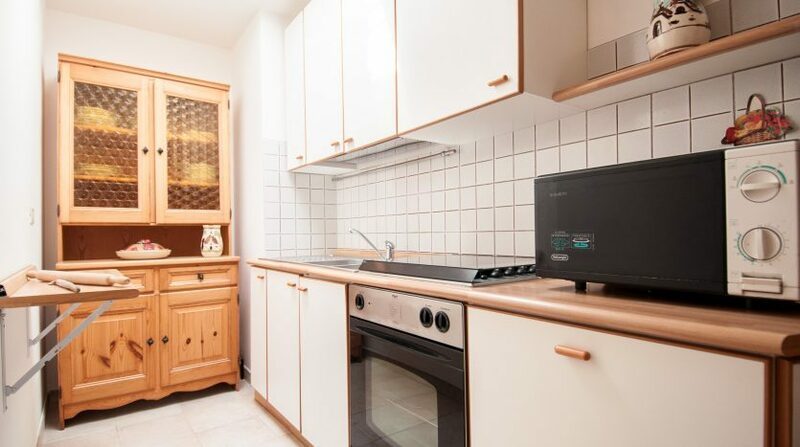 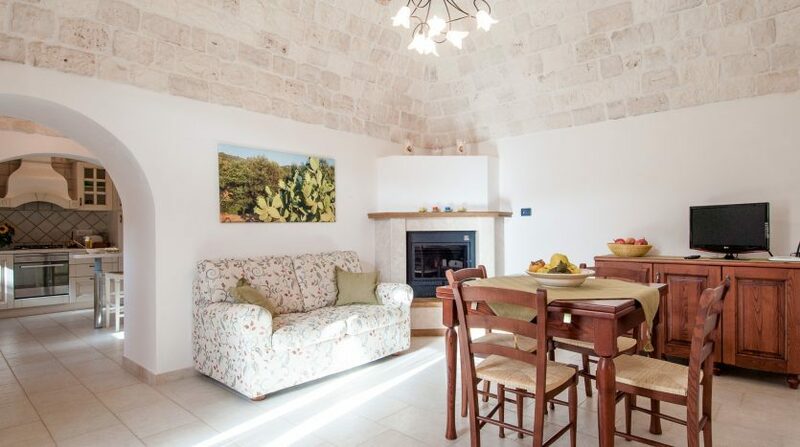 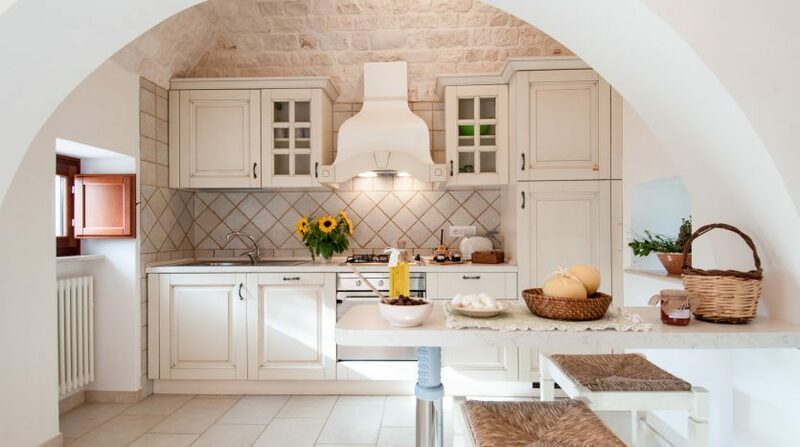 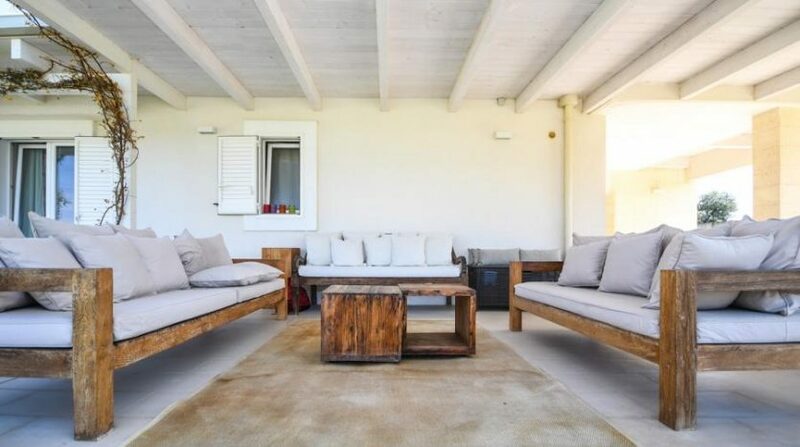 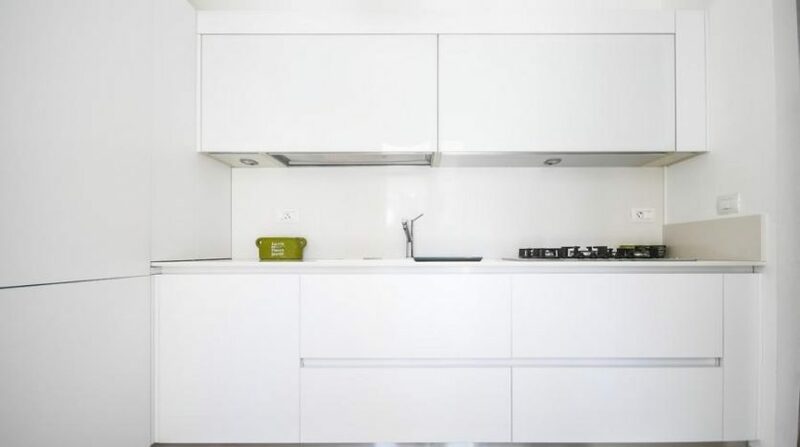 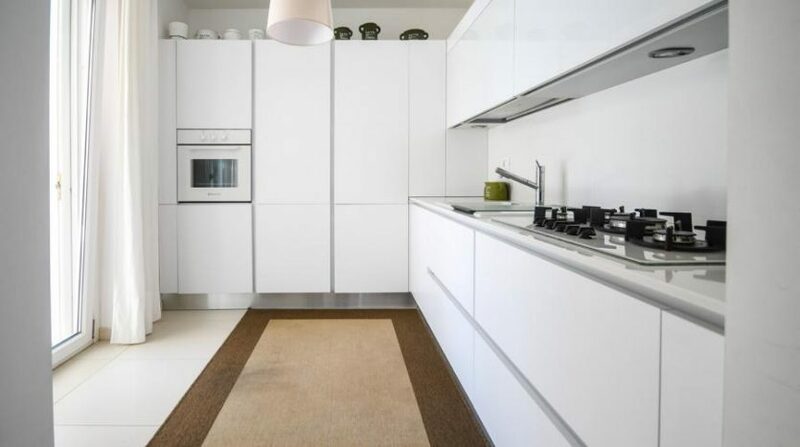 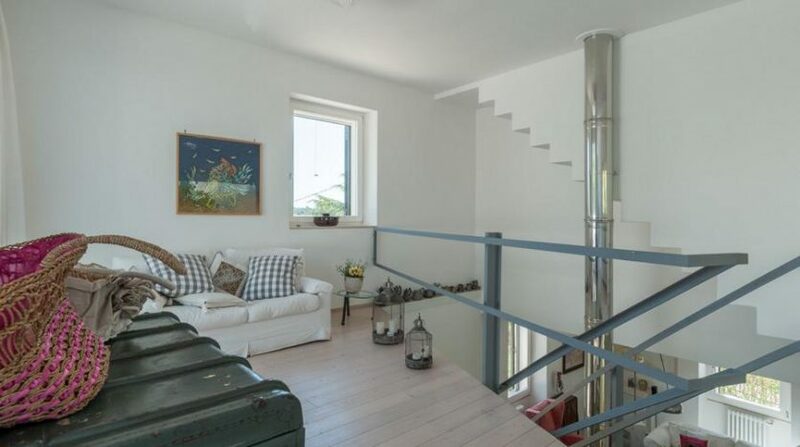 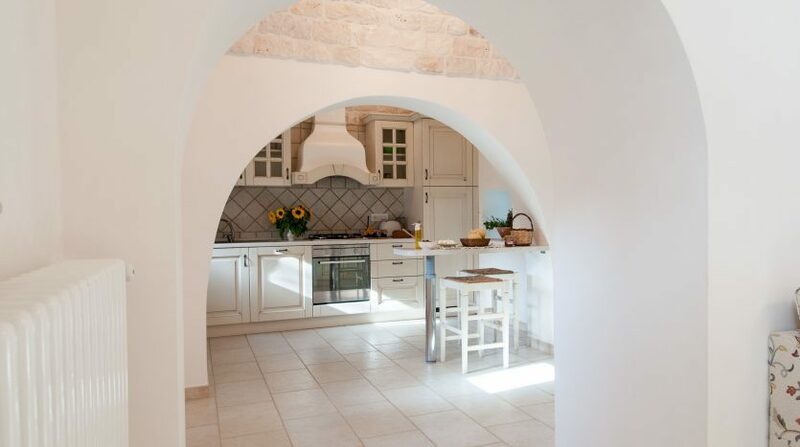 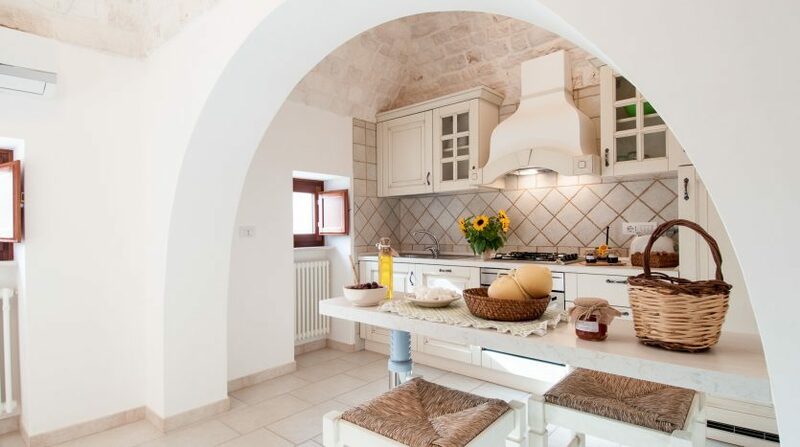 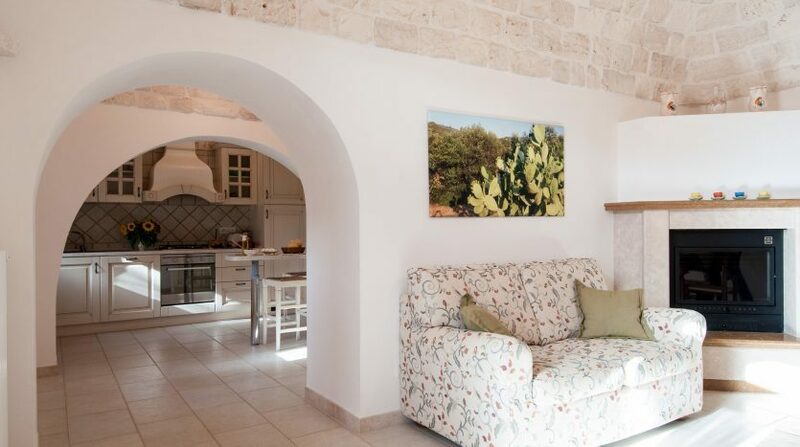 Step into your trulli to find a kitchen-diner with fireplace, sofa bed and well-equipped kitchen. 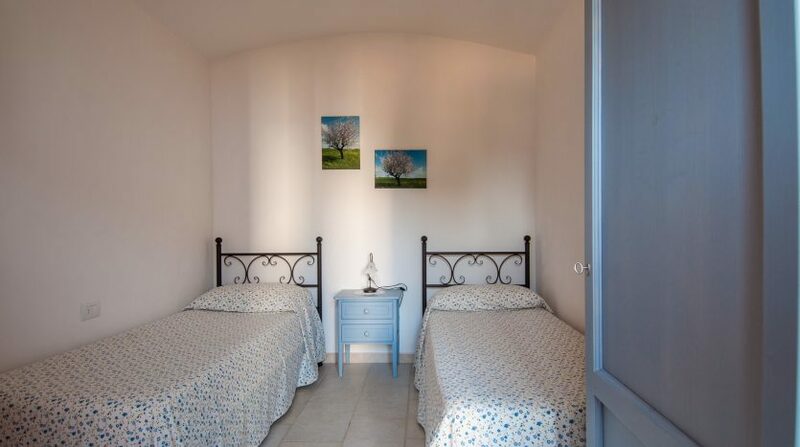 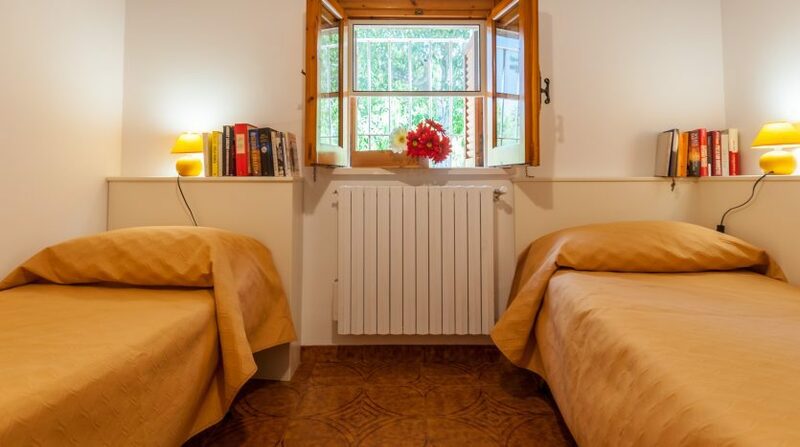 There are also two double bedrooms, a further bedroom with twin beds and two bathrooms with shower, one of which is en suite. 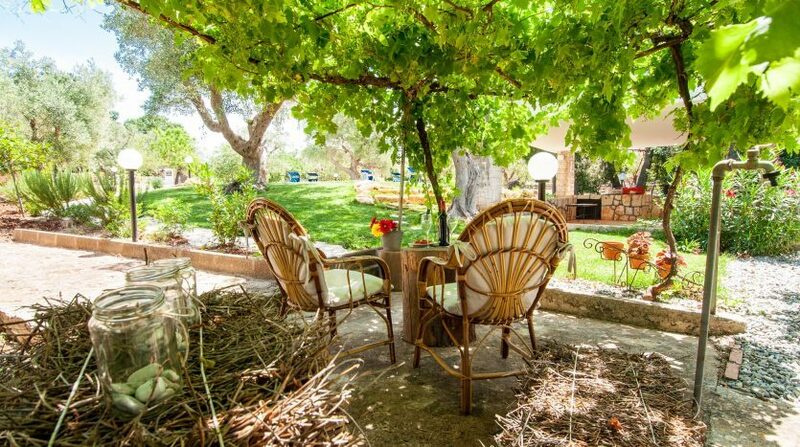 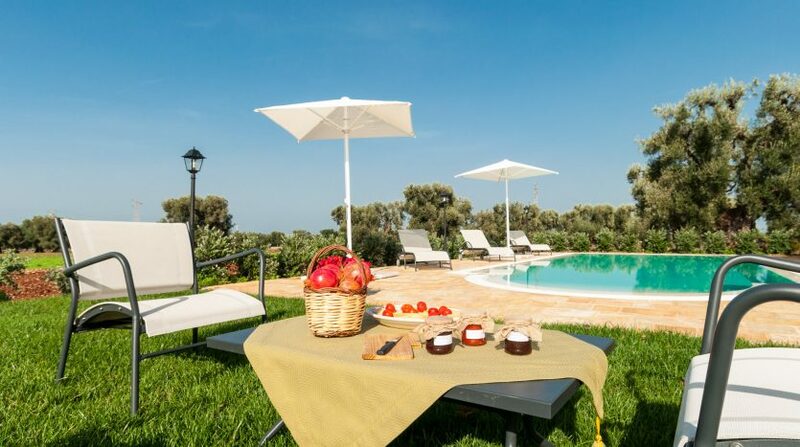 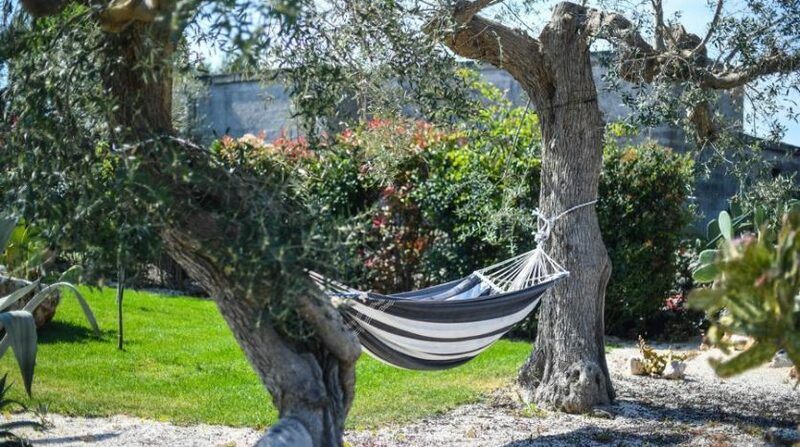 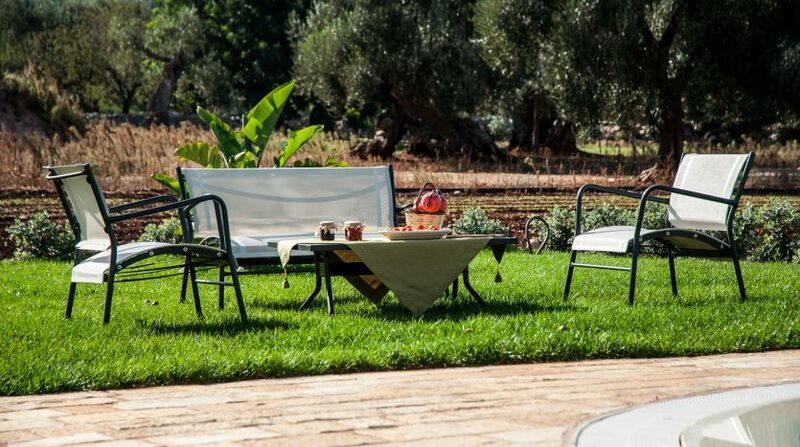 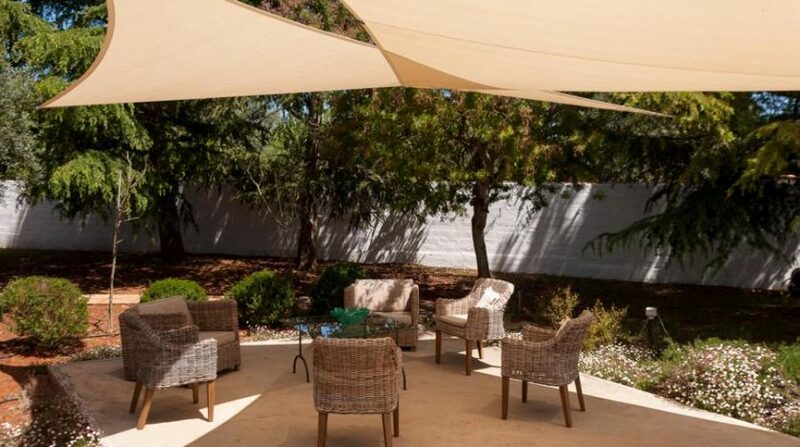 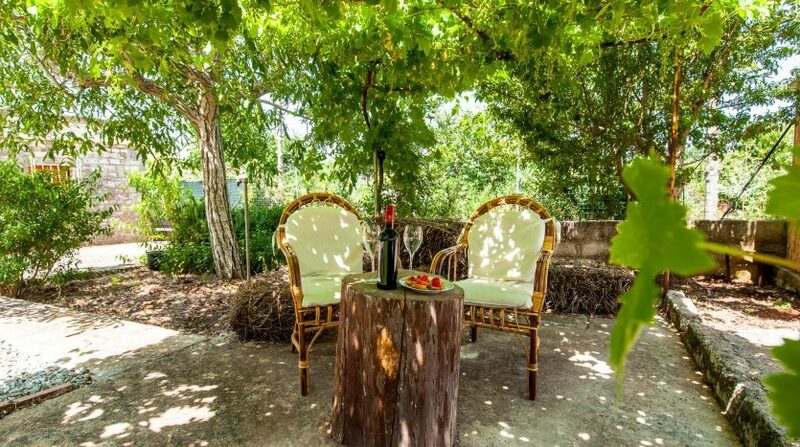 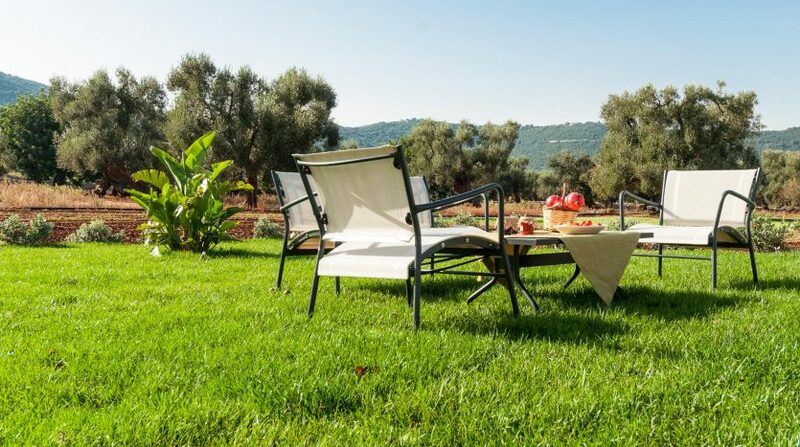 Venture outside to find several lovely seating areas to help you enjoy a relaxing stay in Apulia in close contact with nature. 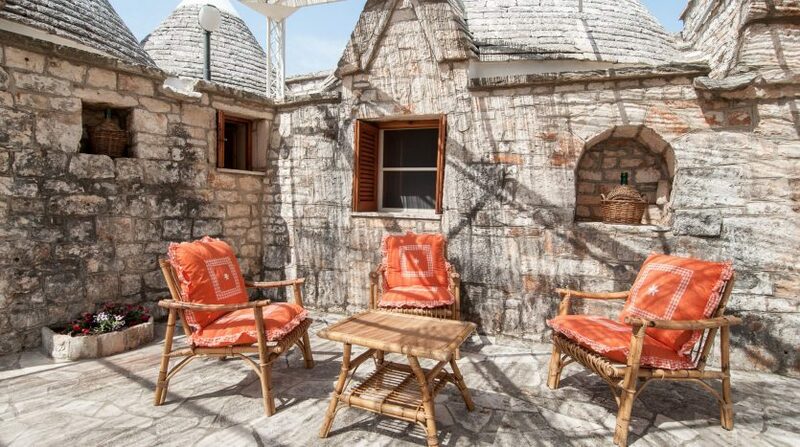 A large, covered outdoor terrace with its own kitchen facilities: wood oven and outdoor grill, plus a large dining area. 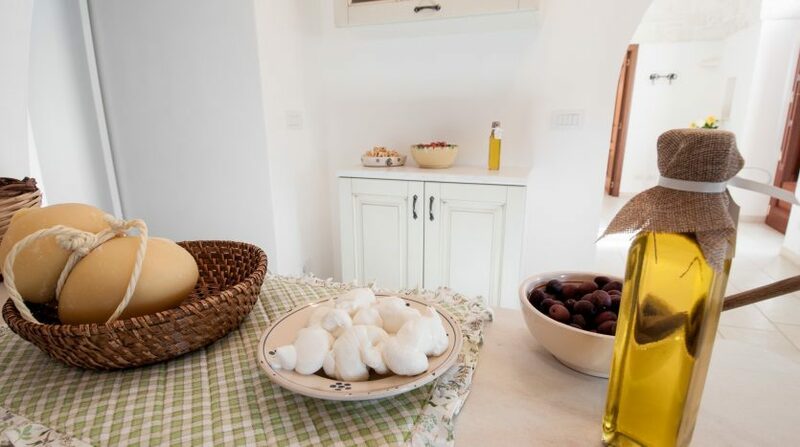 Where could be better to try your hand at the typical cuisine and recipes from Apulia? 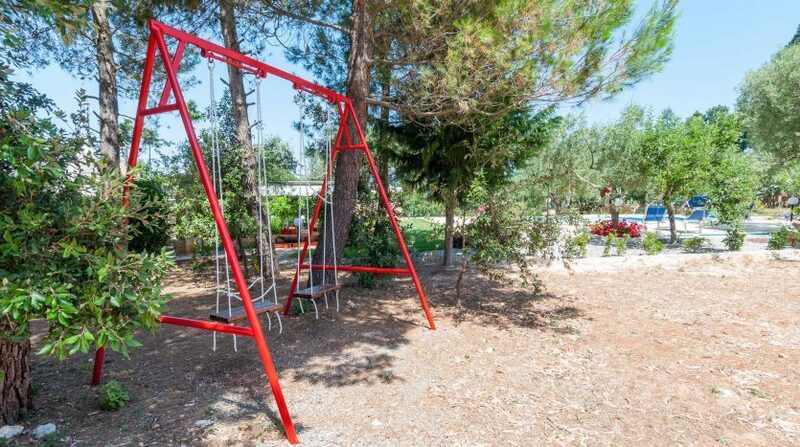 For little guests, there is a small play area. 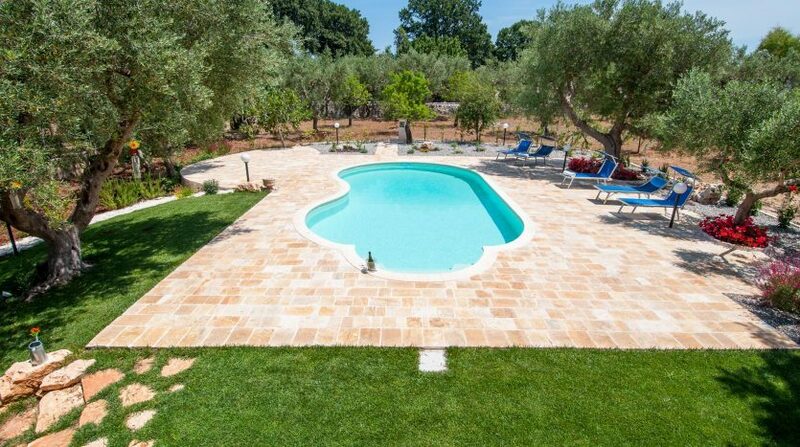 The pool measures 10m x 5m, has an outdoor shower and sun beds and is surrounded by a lot of greenery. 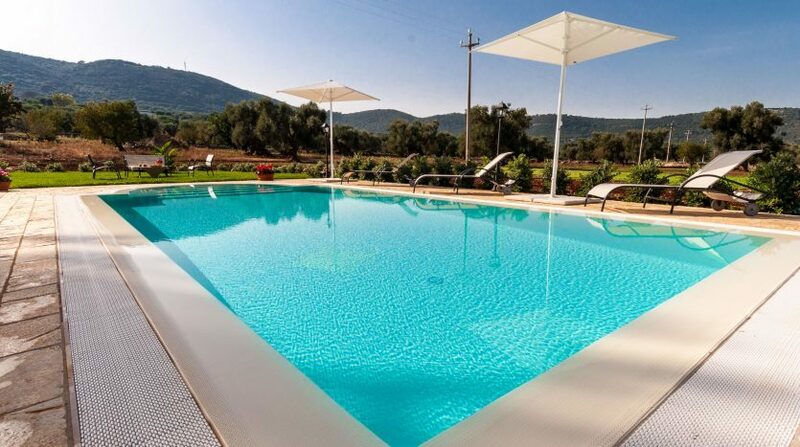 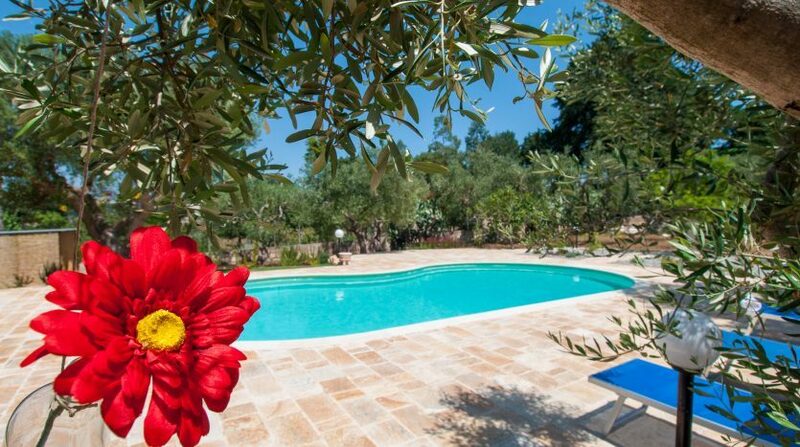 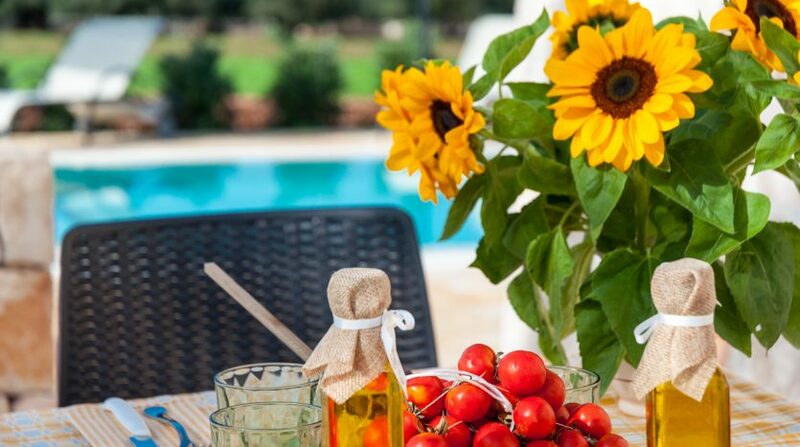 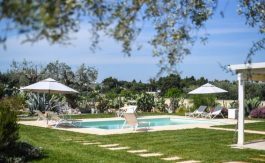 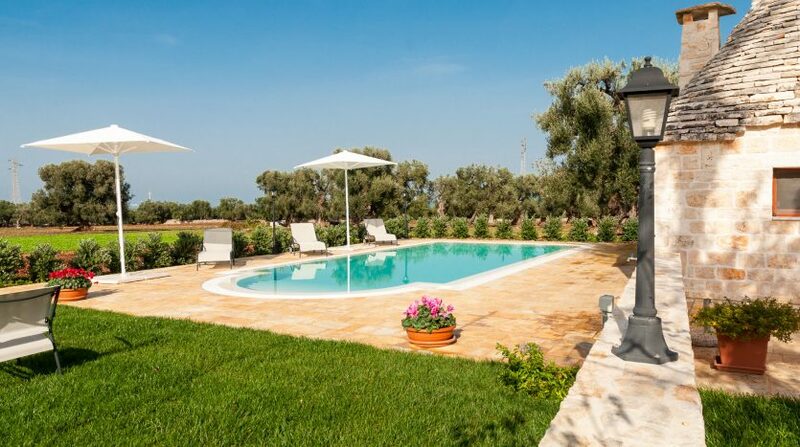 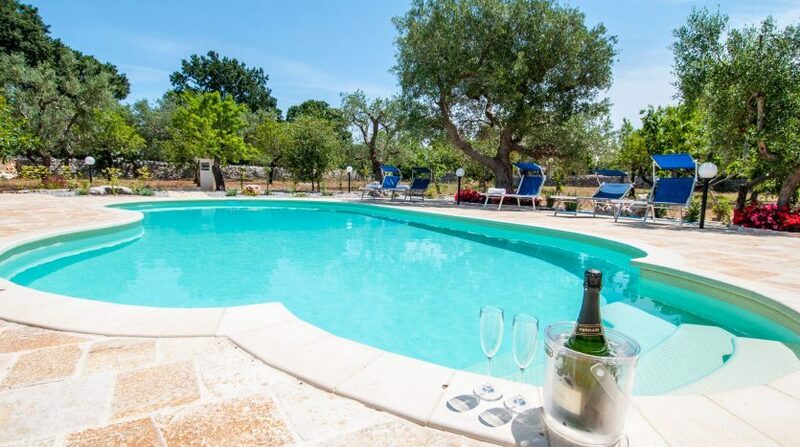 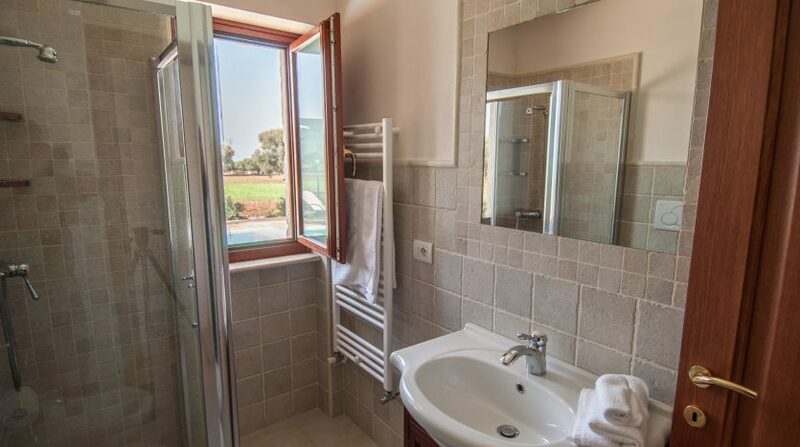 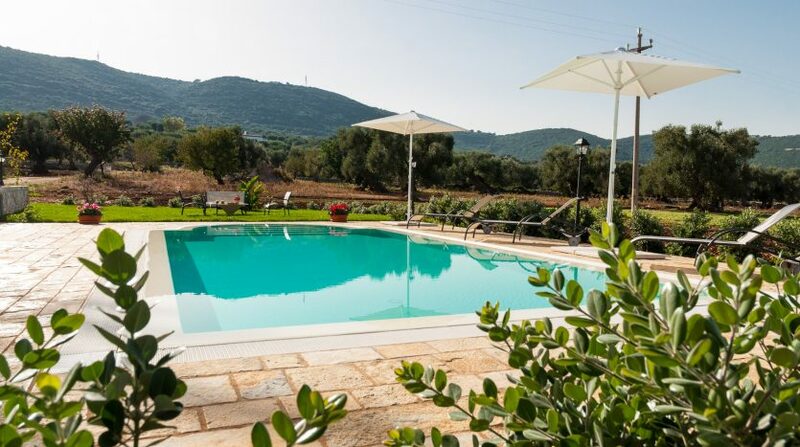 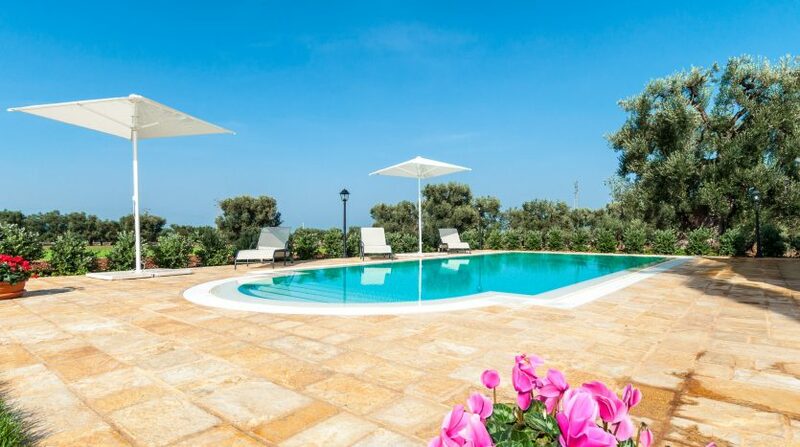 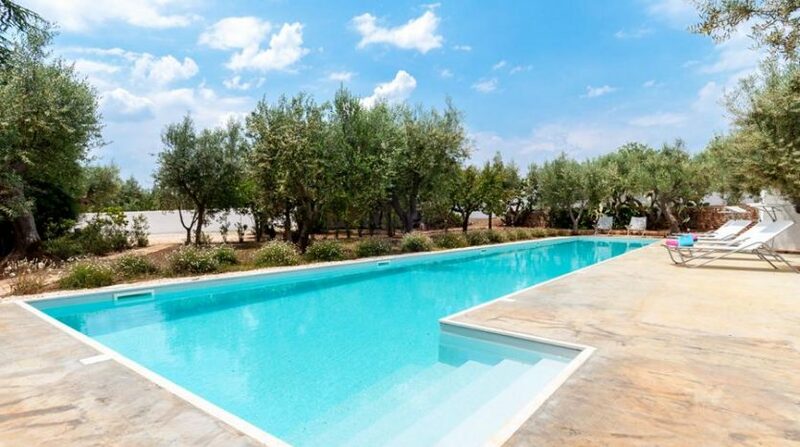 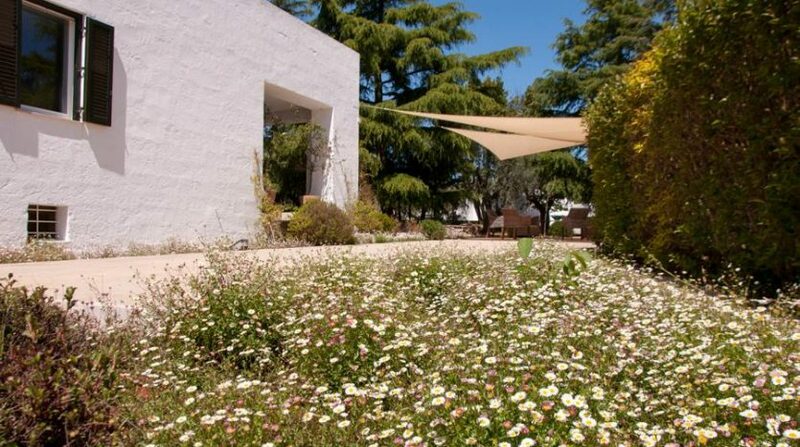 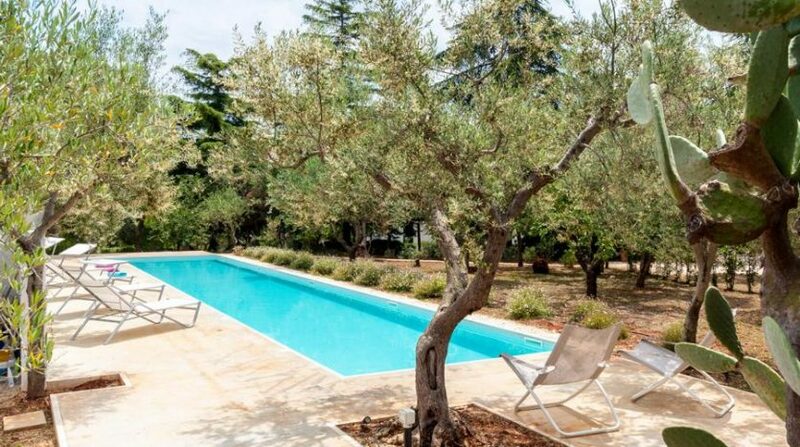 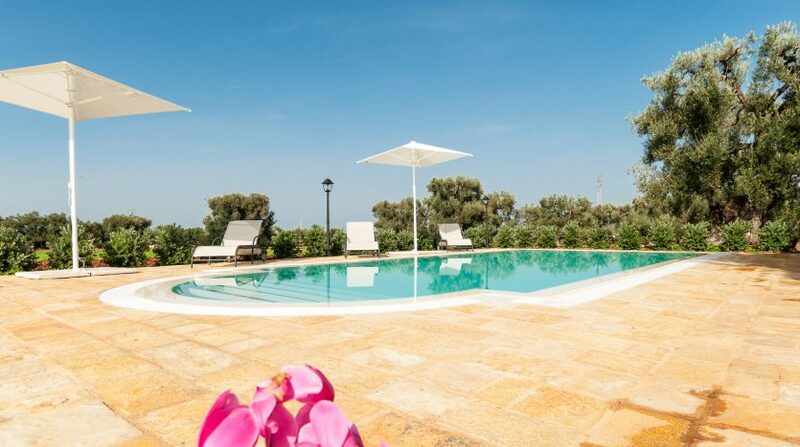 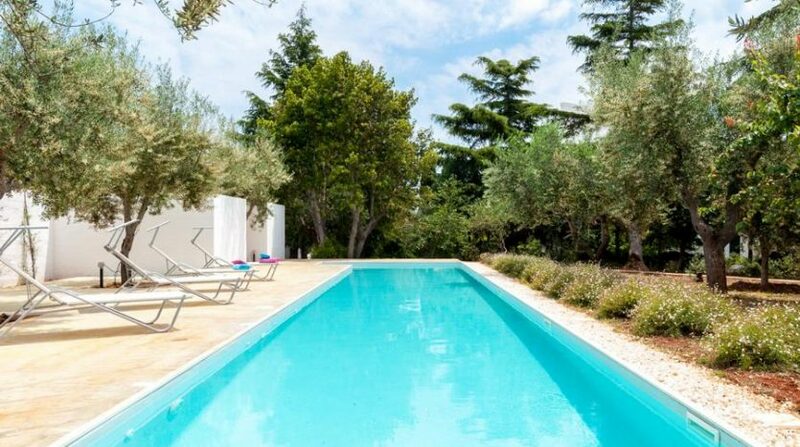 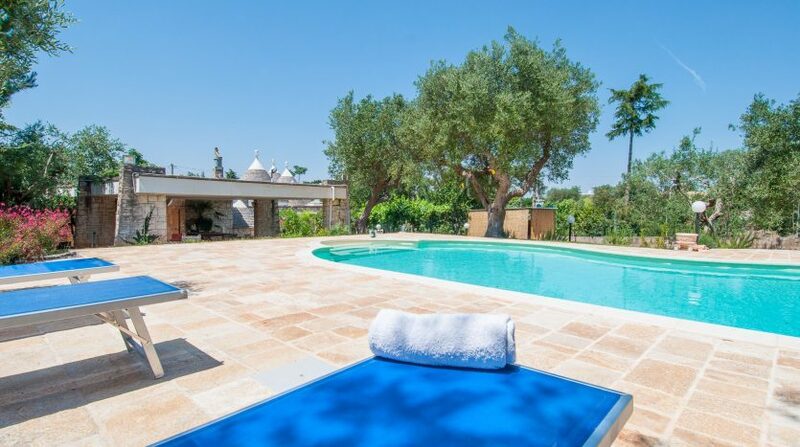 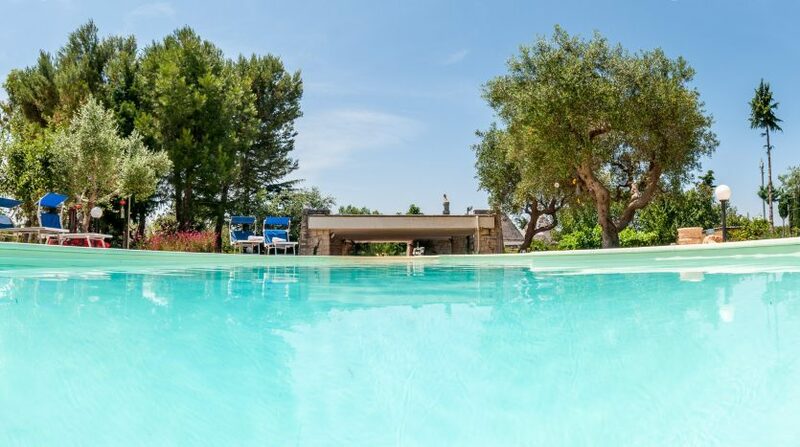 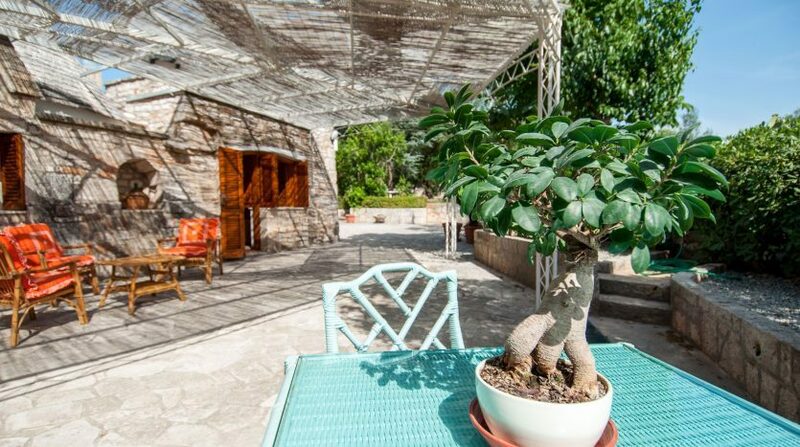 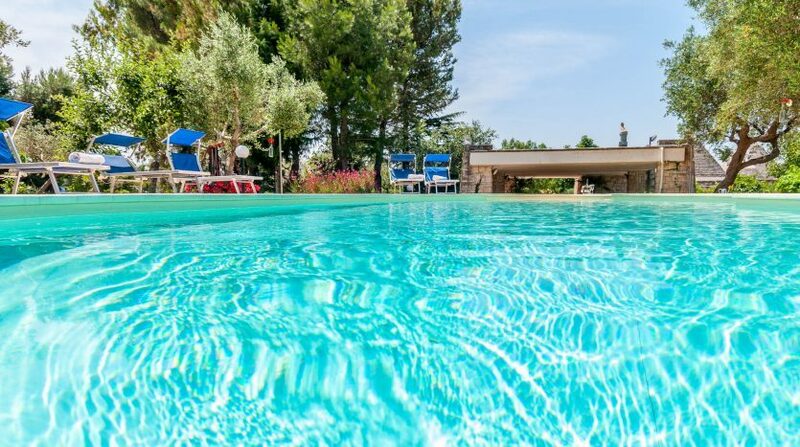 The garden of this lovely holiday villa with pool in Salento features ancient groves and many colourful flowers. 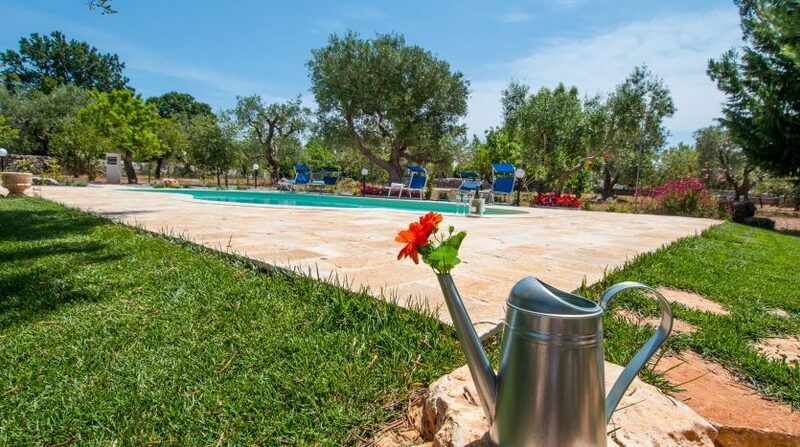 The pretty village of Contrada di Gorgofreddo is only a short walk away. 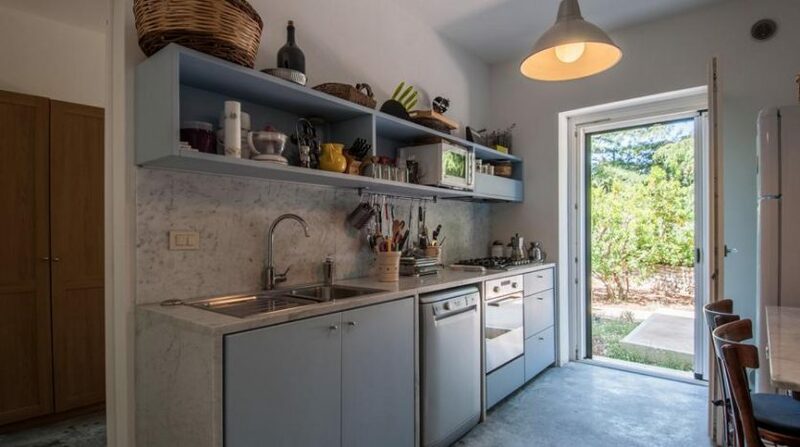 It has a supermarket, a bar and a restaurant. 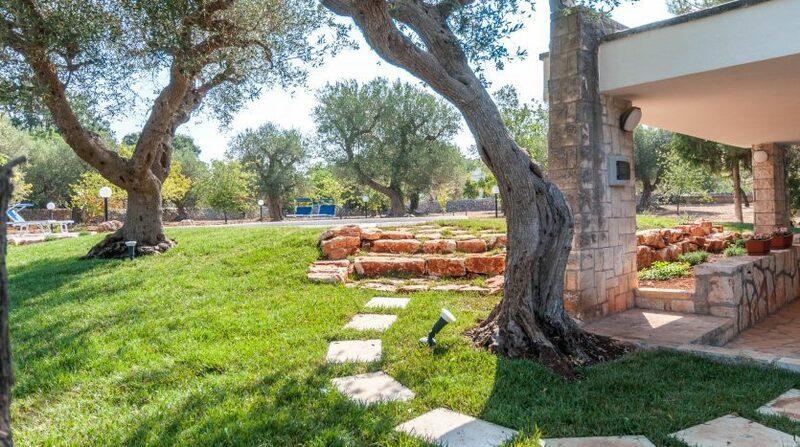 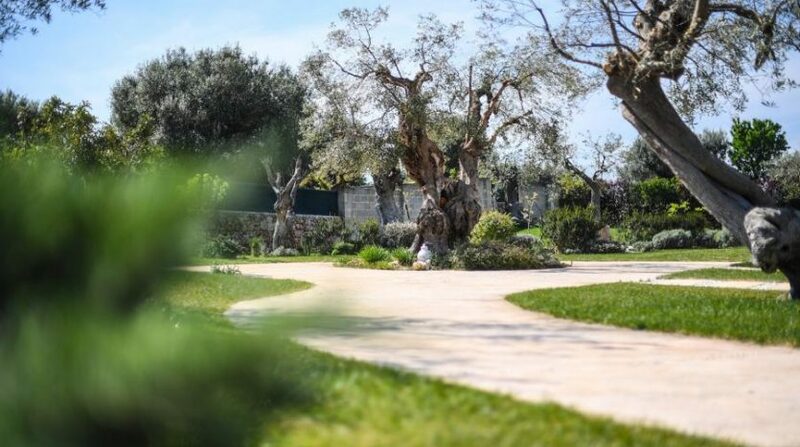 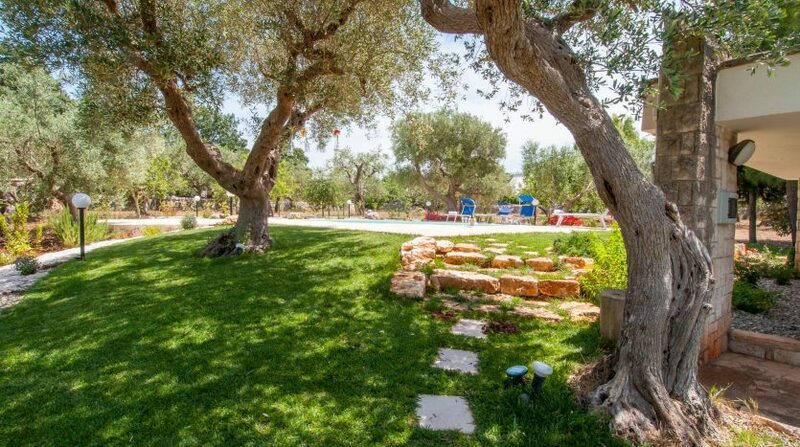 Trulli Margherita is the ideal destination for families with children or a group of friends who want to live the original experience of Apulian nature and tradition. 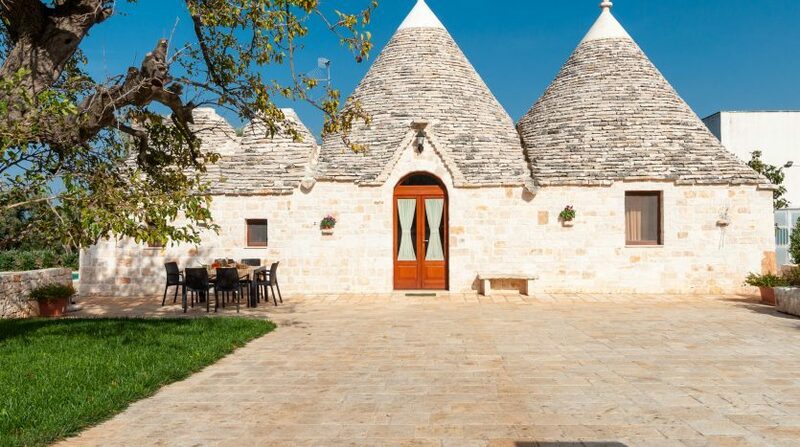 Trulli Margherita is located in the undulating landscape of the Salento region, in the Itria valley and not far from the sea. 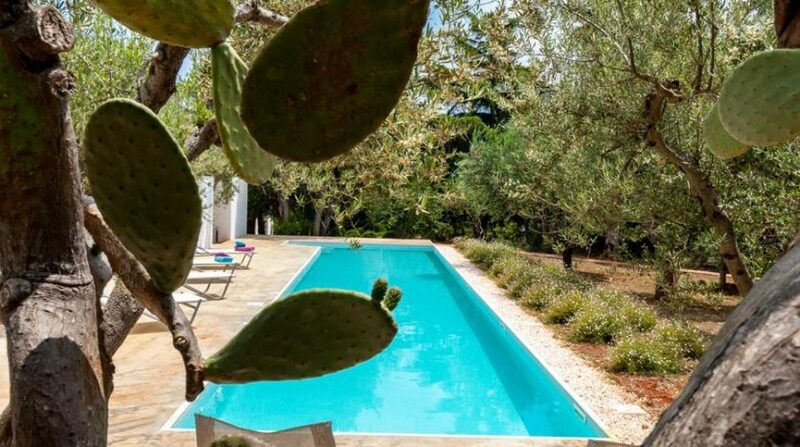 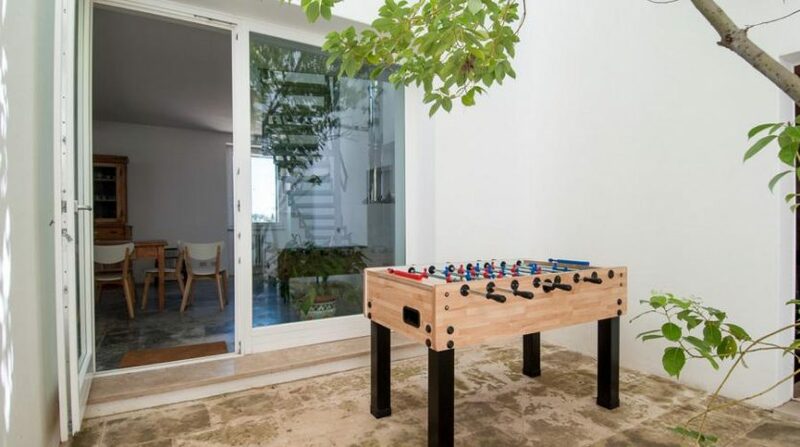 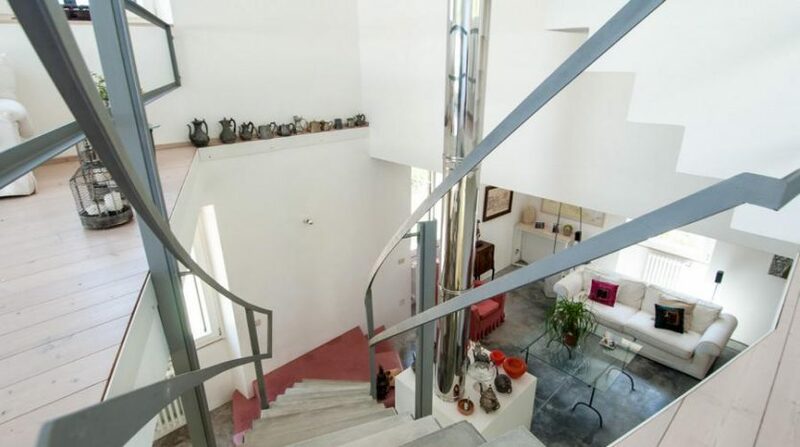 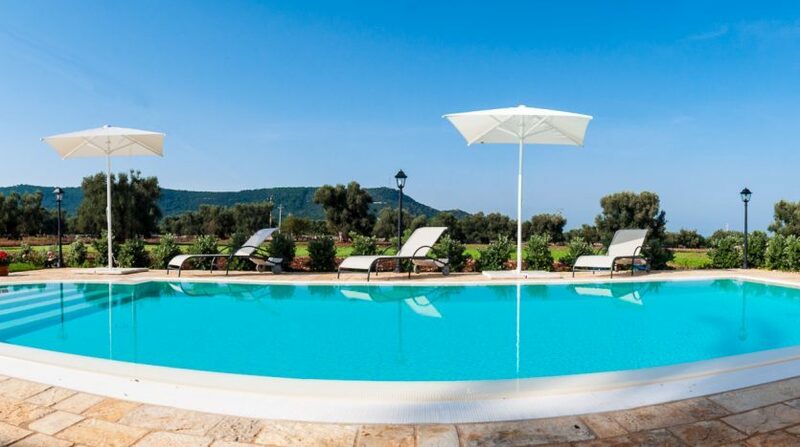 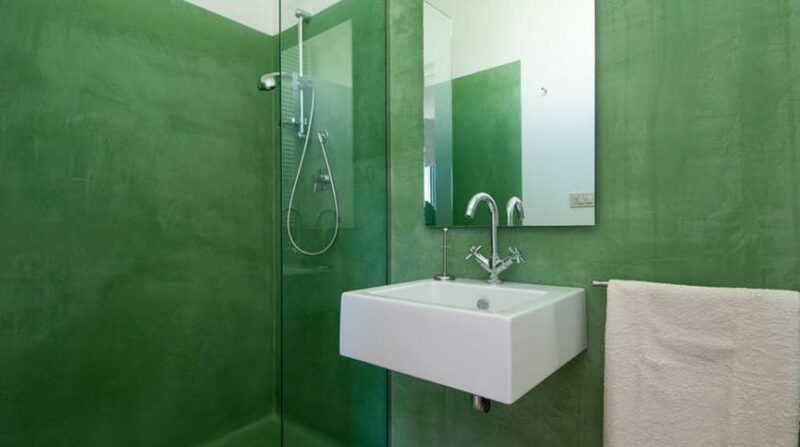 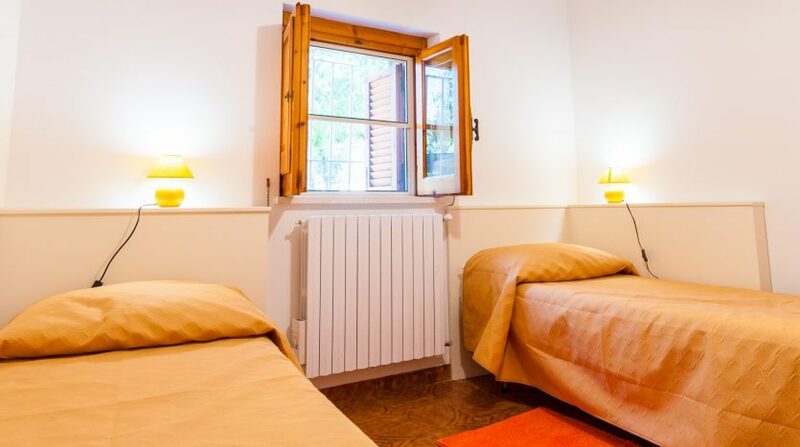 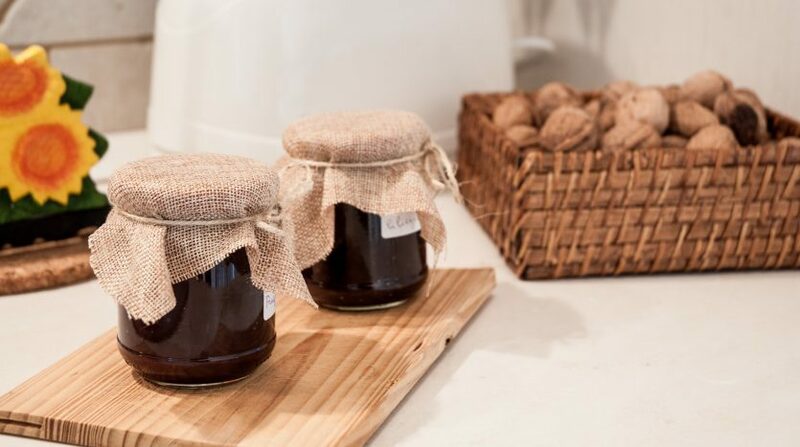 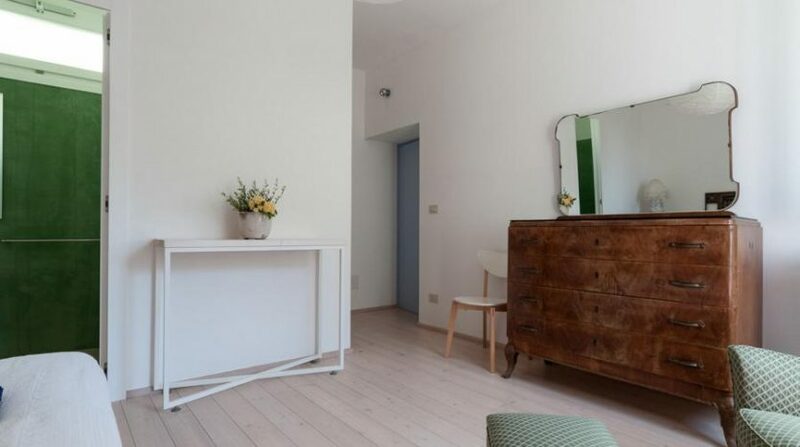 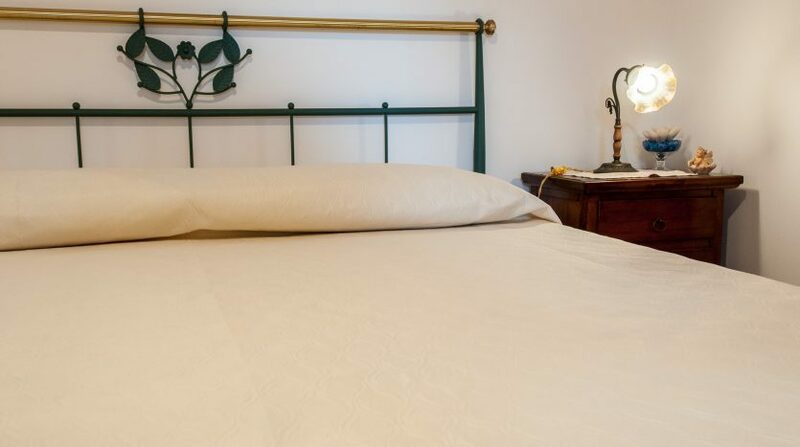 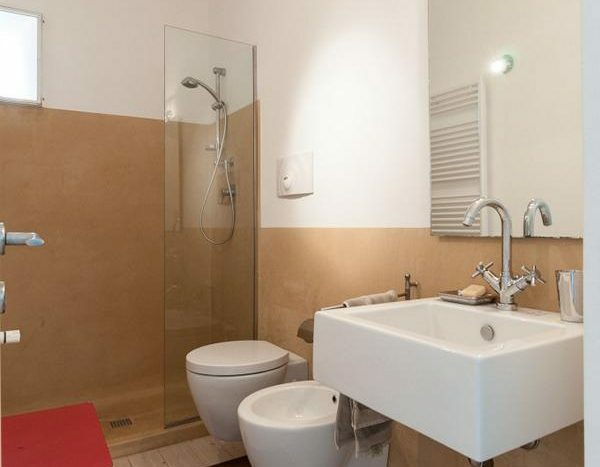 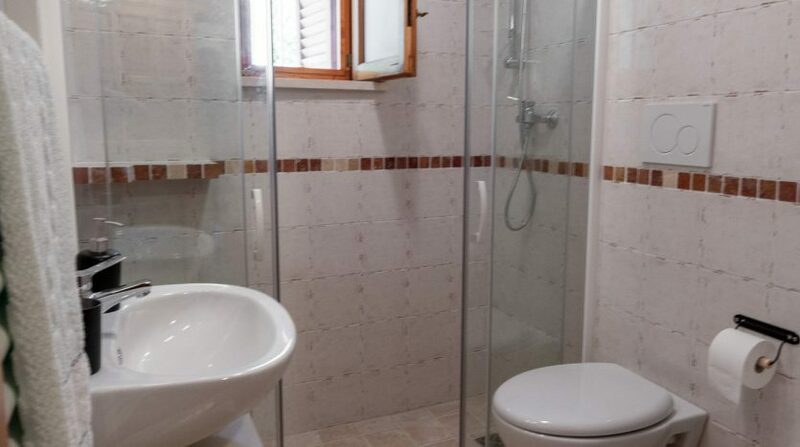 All the amenities of the Apulia region are within close reach, and you are never far away from some of the loveliest towns and villages of the region. 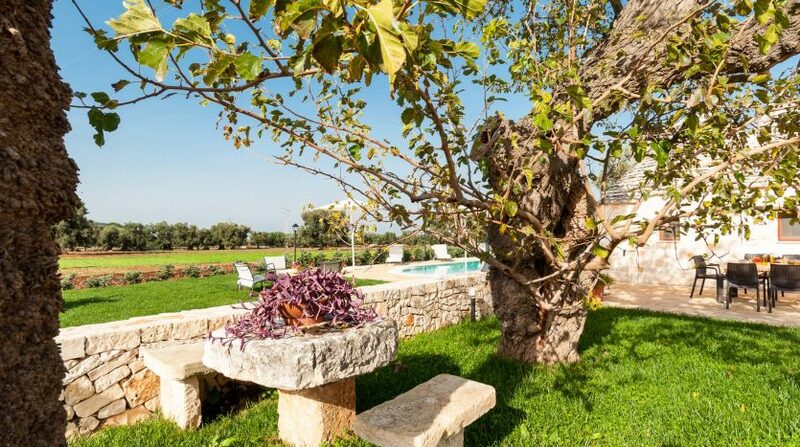 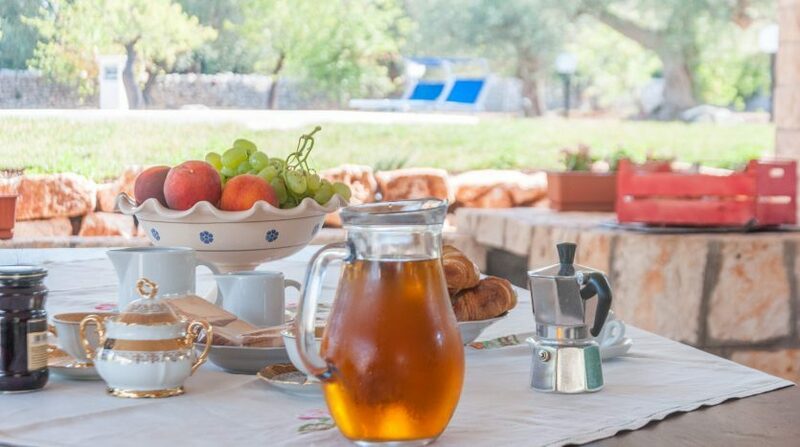 If you are looking for a holiday with family or friends, or if you are a young family, you will find what you need in Apulia. 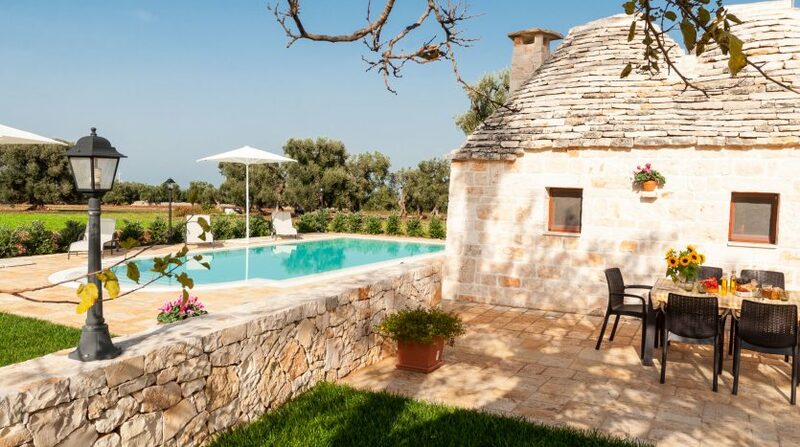 Beautiful beaches, clear waters, lovely towns that form part of UNESCO Word Heritage… You will find it all in Apulia.